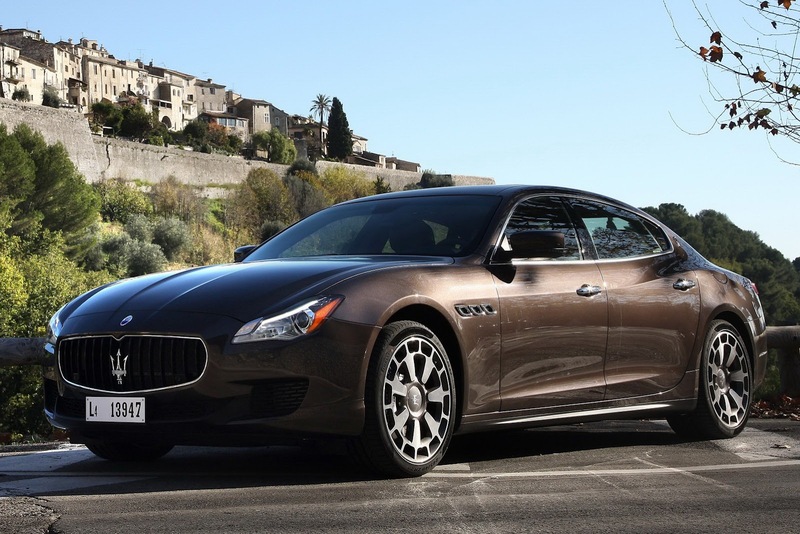 quanto ti piace la Maserati Quattroporte 2013? 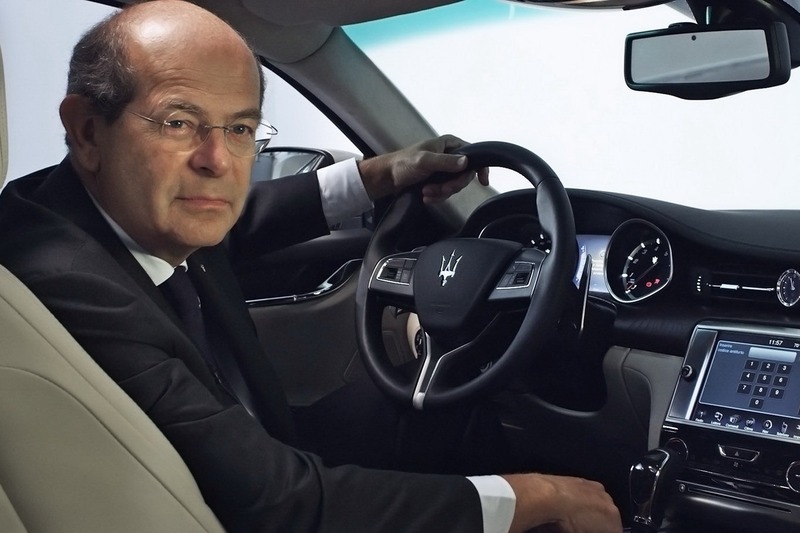 1. quanto ti piace la Maserati Quattroporte 2013? “It is a growth based on those values of style, elegance, quality and performance for which Maserati has always been recognised and praised in almost 100 years of history. This exciting progression will make the new Maserati a true global player with two new production sites in two different continents and a heart solidly planted in Modena, Italy, where our roots are. 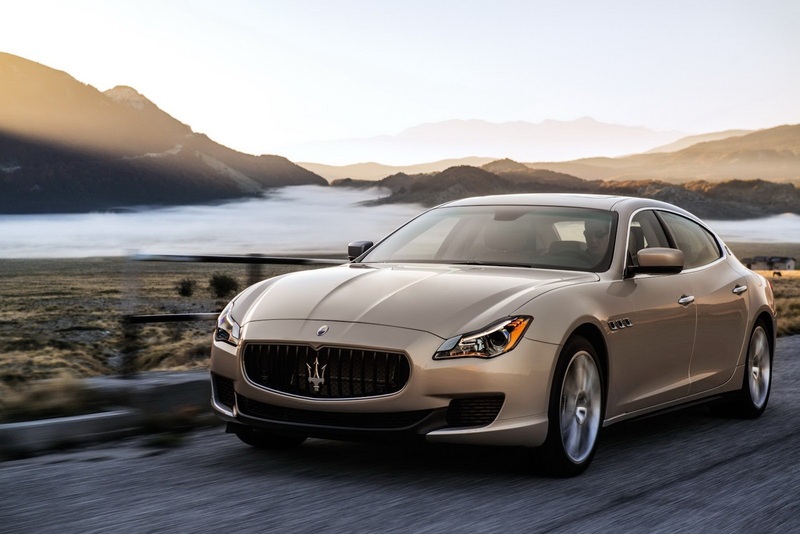 “The new Maserati Quattroporte is a high-performance sports luxury saloon that reinterprets the design features of classic Maseratis in a contemporary design language. Its style was born out of the guiding design principles of Maserati: harmony of shapes, dynamism of lines and Italian elegance. 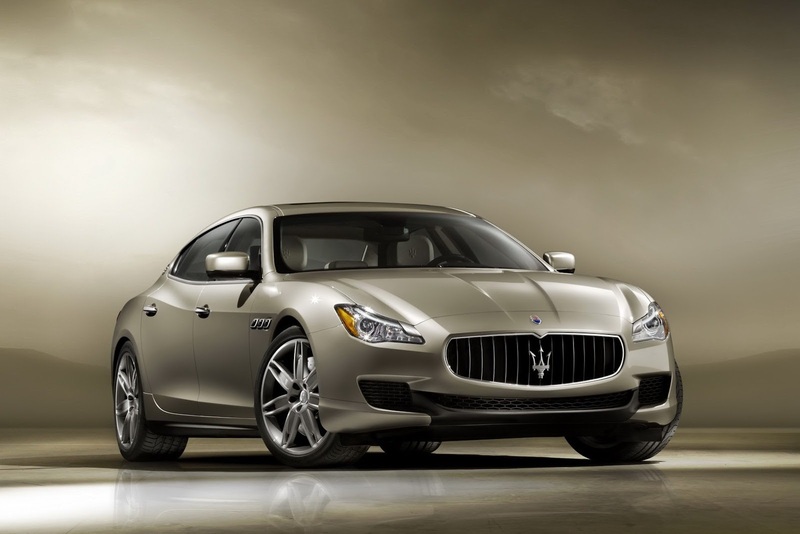 More generous in size when compared to the previous model, the new Quattroporte has a design that is at once graceful and sinuous, fashioned to bring out the sporty nature of the car. “Some of the elements characterising the previous model have been purposely maintained: the front grille, the three side vents and the triangular C pillar. 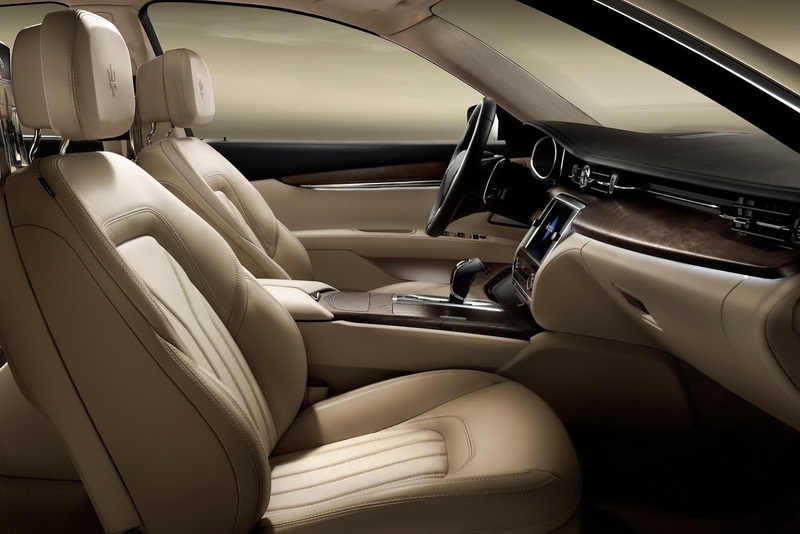 At the same time new style and functional features have been introduced: the strong belt line that runs through the entire side of the car giving the new Quattroporte a look and feel that is at once muscular and elegant, with frameless doors and three side windows. 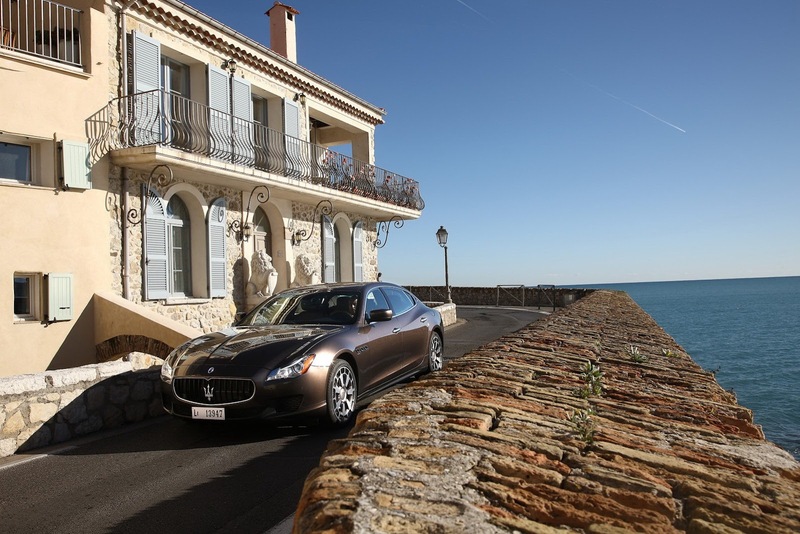 “The innovative Maserati engines of the all-new Maserati Quattroporte have been designed and developed by Maserati and Ferrari engineers in the heart of Italy’s motor valley. They are going to be produced in the Ferrari plant in Maranello that has been synonymous with cutting-edge technology and passion for well over 60 years. 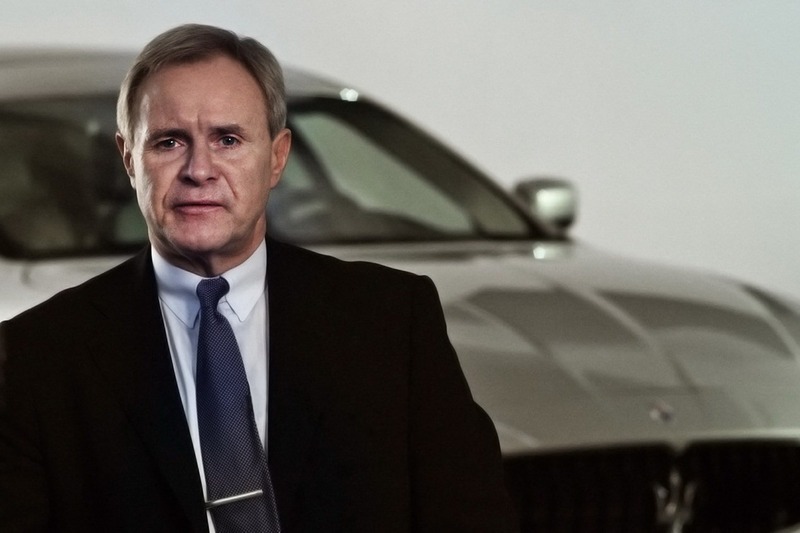 “Maserati engineers have worked – with a competence matched only by their passion – in chassis designing and engineering, weight reduction, ergonomic enhancement to develop a car capable of fitting different powertrain architectures and transmission configurations for the most diverse driving conditions but always maintaining Maserati’s trademark best-in-class driving comfort. With an eight-speed automatic transmission and both rear-wheel drive and all-wheel drive configurations (V6 only, AWD not available in RHD markets), it is also the most secure all-weather performance car in Maserati's history. 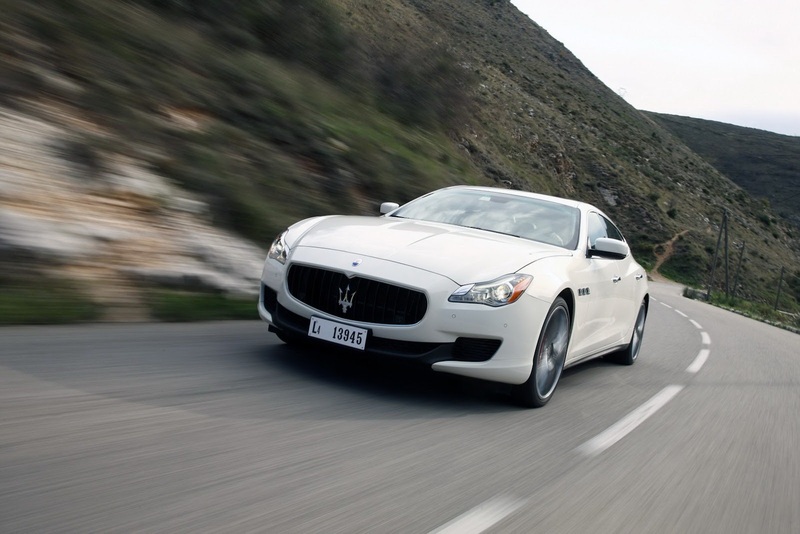 To offset its scintillating performance, the V8 Maserati Quattroporte has lowered both its fuel consumption and emissions by 20% over the outgoing Quattroporte. The all-new architecture retains the Maserati Quattroporte's traditionally exquisite handling thanks to its 50:50 weight distribution, a double-wishbone front suspension and a state-of-the-art five-link rear suspension. It can now deliver the added security and all-weather assurance of all-wheel drive as well. It also delivers new standards in quality in every area from design, development, fabrication and process controls. It is produced in a new plant that combines Maserati's traditions of craftsmanship with cutting-edge technologies that are able to guarantee outstanding quality by controlling even the tiniest details. Traditional hand crafted detailing continues in the Quattroporte's cabin, now more spacious and featuring both four and five-seat layouts. Cabin luxury leaps forward technically too, with features like the Maserati Touch Control screen, adjustable pedals (left hand drive only), reversing camera and the optional 15-speaker Bowers & Wilkins audio system, as well as WLAN-based WiFi and compatibility with most modern mobile phone systems. 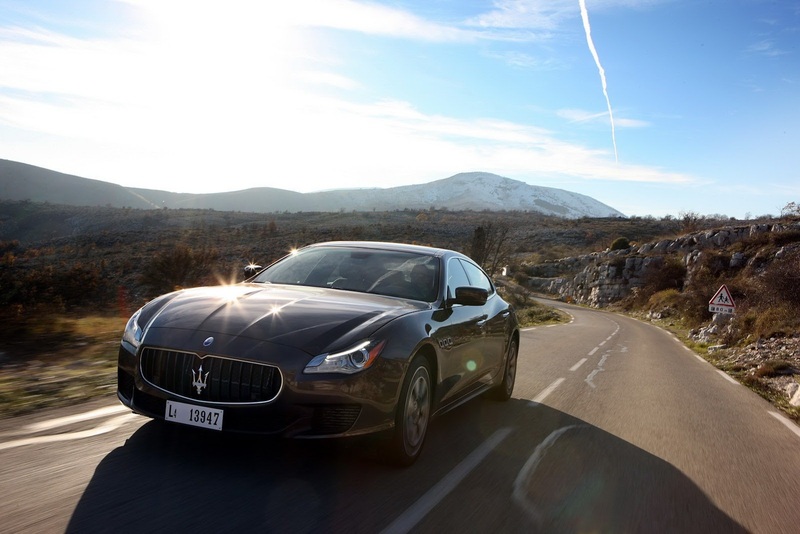 With the original Quattroporte in 1963, Maserati invented the concept of the luxury sports saloon and the new Quattroporte continues to be the benchmark for high quality engineering, supercar performance and comfort. 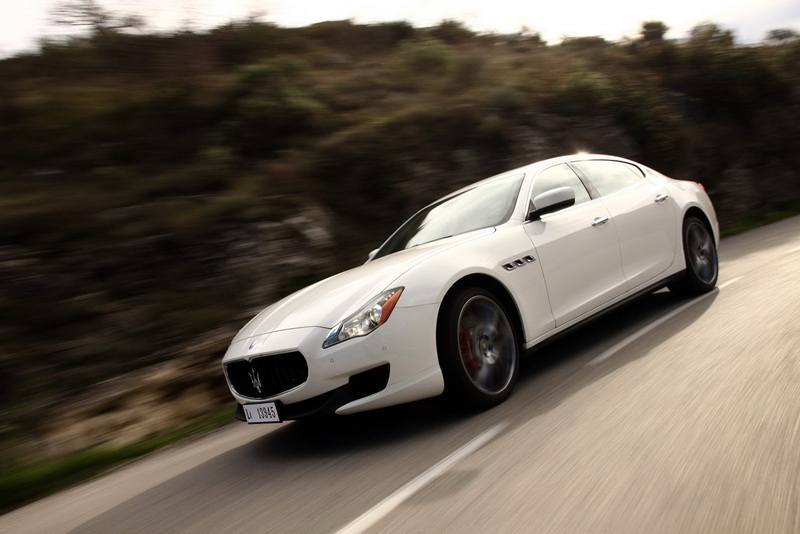 Maserati has been considered a master of sports saloon design from the day the original 1963 Quattroporte became the first automobile to blend speed and luxury with four doors. 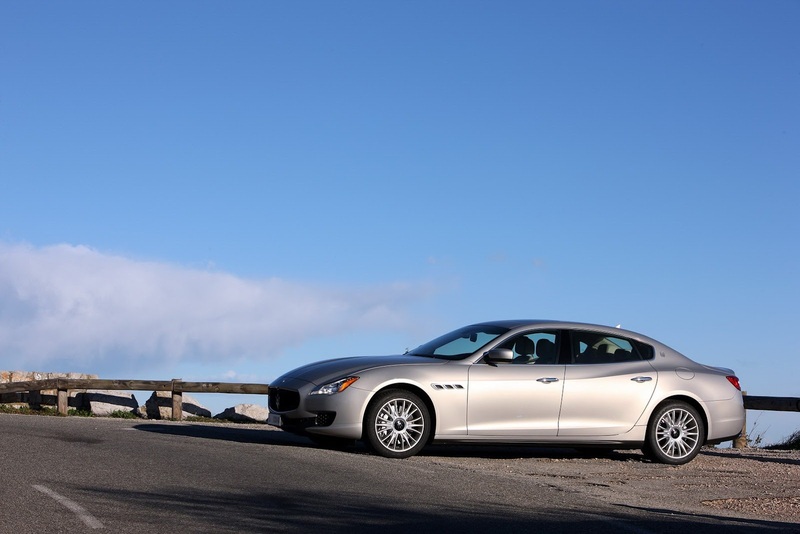 A powerful engine and a large cabin are at the core of the Maserati Quattroporte's design, dominated by a long, impressive nose with its short overhang. 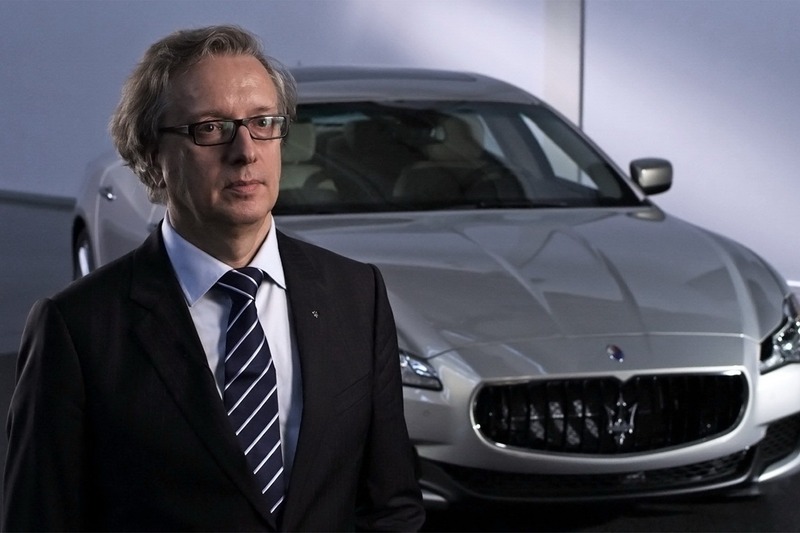 "The design of the Quattroporte is inspired by Maserati's core stylistic principles: harmony of proportions, dynamic lines and Italian elegance," Head of Maserati Centro Stile, Marco Tencone explains. "Every new model is a step into the future, but for a brand with the strong heritage of Maserati it is fundamental to bring on the most distinctive features as a signature: the contour of the air intake in the front, the three small outlets on the front wings and the strong triangular C pillar bearing the logo". "The design has been kept simple and clear - continues Tencone - with a character line flowing on the side to define the strong volume of the rear wing and create a very muscular look. The cabin is sleek, with a three window treatment and frameless doors". 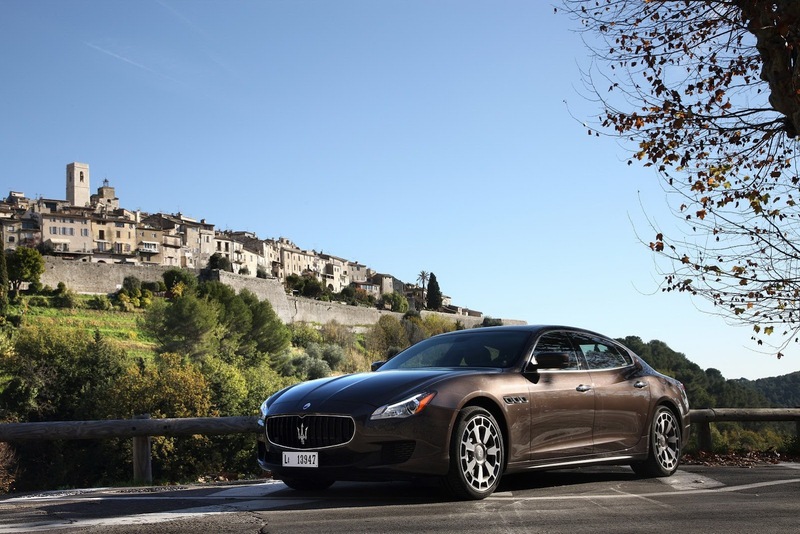 "The Quattroporte is a high performance sports saloon featuring a light, sensual design that embodies all the most famous stylistic touches of Maserati in a contemporary language". But the Maserati Quattroporte body design isn't just about looks; it has delivered a 12% improvement in drag (Cx), down to 0.31, and an enormous 24% reduction in lift. These figures reduce fuel consumption and increase high-speed stability. 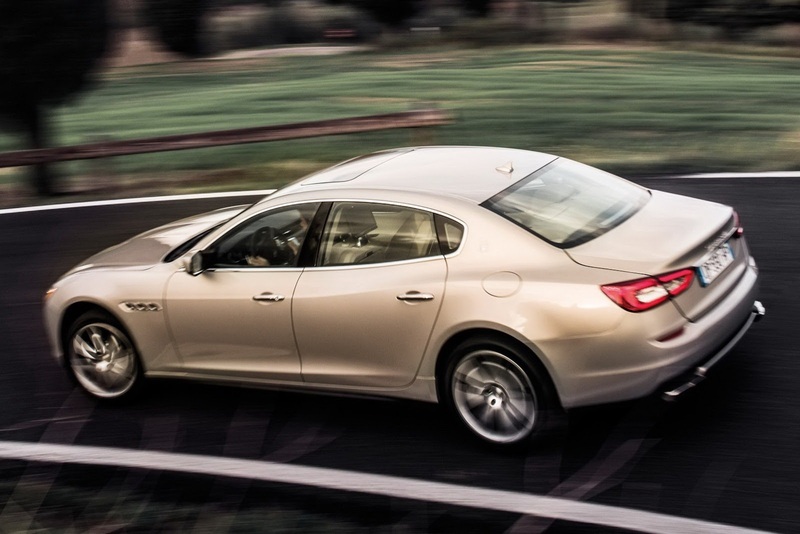 A large part of the Quattroporte's aerodynamic work is out of sight, beneath the car. It has a flat floor that contains several aerodynamic features with the scope of optimising performance by lowering drag coefficient and keeping the proper cooling of all systems (engines, brakes, and transmission) at speeds over 300 km/h. At the heart of the new Quattroporte is an entirely new engine grid, which follows recent Maserati tradition as it is designed in-house by Maserati Powertrain and manufactured under contract by Ferrari at Maranello. The flagship 3.8-litre V8 engine is a perfect representation of Maserati's performance tradition combined with a 20% reduction in emissions. It is almost a litre smaller in capacity than the 4.7-litre V8 in the Quattroporte Sport GT S, yet this is more than countered through twin turbo charging and direct fuel injection to deliver 18% more power and 39% more torque. The engine produces 390kW (530 hp) of power at 6800rpm and accompanies this with 650Nm of torque from 2000rpm to 4000rpm. This maximum normal torque figure can be overboosted to 710 Nm from 2250rpm to 3500rpm. These figures represent the highest specific power output in the class, with 139hp/l, and the best specific torque as well, with 171Nm per litre. It also has a considerably more powerful engine than the finely balanced 4.7-litre engine in the Maserati Quattroporte Sport GT S, with a full 59kW (80hp) more power and an astonishing 200Nm more torque (on the overboosted output). The torque peak also arrives at less than half the engine speed of the Sport GT S's V8, too, peaking at 2000rpm versus 4750rpm. 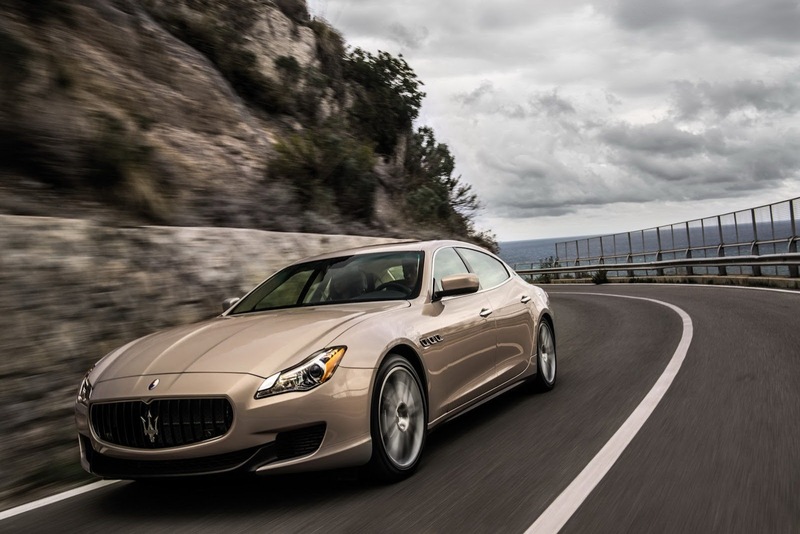 In addition, its combination of a lighter body design and a stronger engine give the Quattroporte the best power-to-weight ratio in class, with just 3.6kg for each horsepower. These engine figures help the Quattroporte reach 100km/h in just 4.7 seconds, which is 0.3 seconds faster than the previous Sport GT S, making the new Quattroporte the fastest accelerating four-door car in Maserati's history. This also makes it 0.6 seconds faster to 100km/h than the outgoing Maserati Quattroporte S and almost a second faster than the 4.2-litre Quattroporte. Another ground-breaking figure is the Quattroporte's top speed, comfortably breaking through the 300km/h barrier to reach 307km/h (191 mph). Again, this makes it the fastest four-door Maserati in history and second amongst all Maserati production cars behind the mighty V12-powered MC12. However, the new engine is not just about big performance numbers or high torque. Maserati engines have always been known for their incredible throttle response and that unique Maserati sound - and this engine is no different. 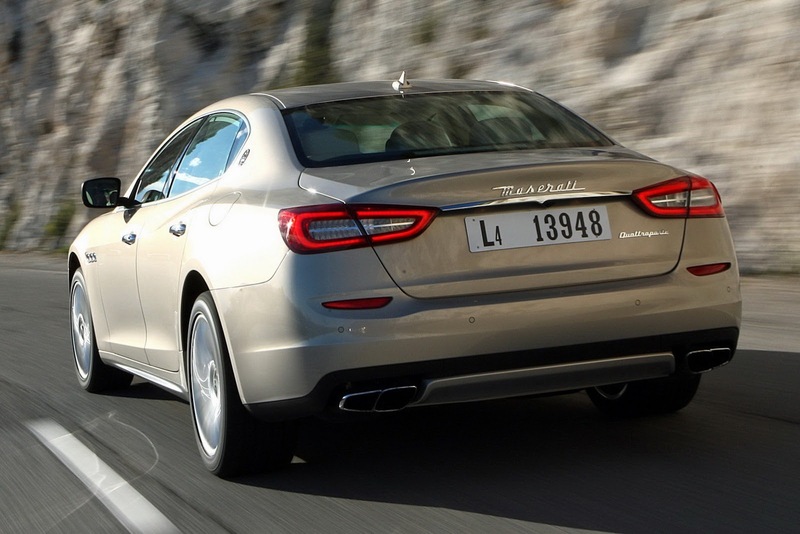 The new engine generation's smaller capacity does help with the Quattroporte's handling too, but Maserati's engineers concentrated mainly on delivering the brand's traditional crisp pickup and low rotational inertia. 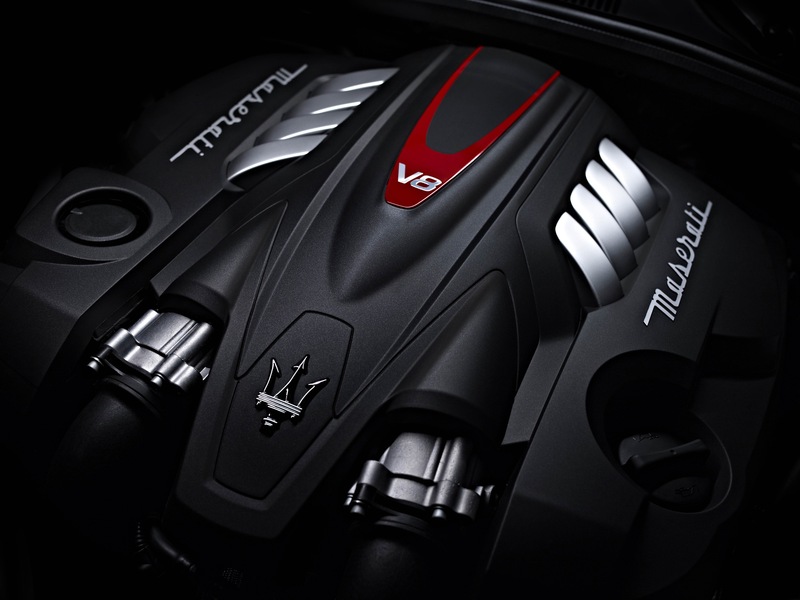 The most technically advanced engine ever fitted to a Maserati, the 3799cc V8, uses a pair of low-inertia, twin-scroll parallel turbos to increase its output. Its architecture retains the over-square, free-revving nature of the outgoing V8, with a bore of 86.5mm and a stroke length of 80.8mm, and it has a slightly lower compression ratio of 9.5:1. It has been specifically designed to deliver exceptional performance at all engine speeds, combined with lower consumption and emissions. The engine diagrams show that the V8 engine's torque is very high, even at speeds as low as 1500 rpm. 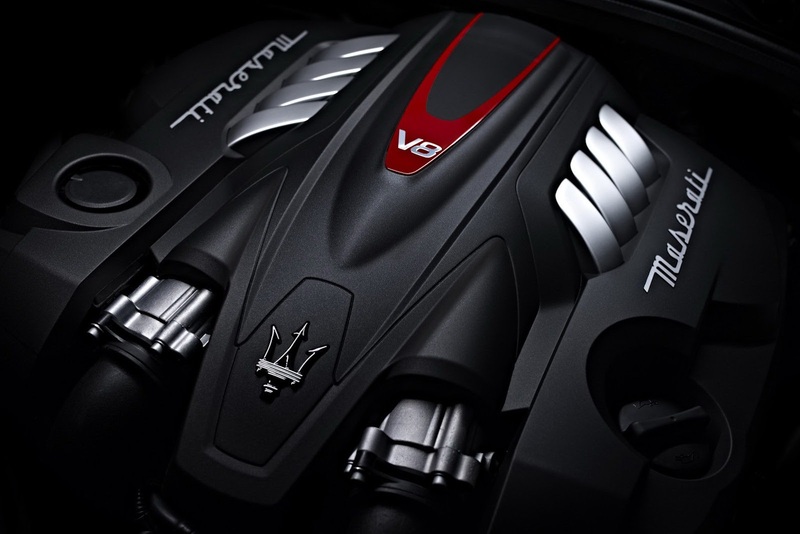 It uses high-tumble cylinder heads with four cam phasers, (doubling the number of the naturally aspirated V8), in a concept refined by Maserati Powertrain for optimal combustion control to deliver high performance and low consumption. With hydraulically adjusted roller finger followers and two continuous cam phasers for each cylinder head, it can advance or retard the inlet and exhaust valve timing independently in real time and it also reduces friction losses compared to old valvetrain systems. Another characteristic feature of the new Maserati engine family is the 200 bar direct fuel-injection system. This very high pressure, coupled with seven holes laser drilled oriented holes injectors and multiple injection, helps atomising the fuel directly in the combustion chamber, thus improving the fuel-air mixture and the combustion process at any engine speed. 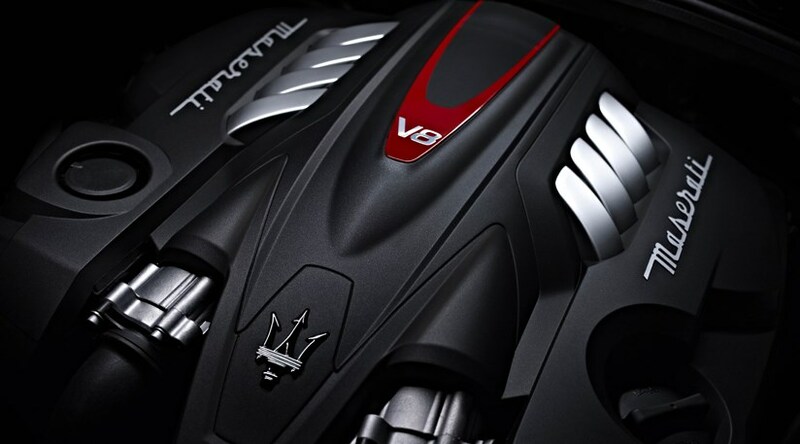 The new V8 engine is boosted by two small parallel twin-scroll turbines, (one for each bank of four cylinders), which provide the high performance expected of a Maserati engine while reducing inertia. Maserati Powertrain focused on integrating the turbine housing into the exhaust manifold for a compact, light-weight solution. Each turbocharger is fed by its own air-to-air intercooler. 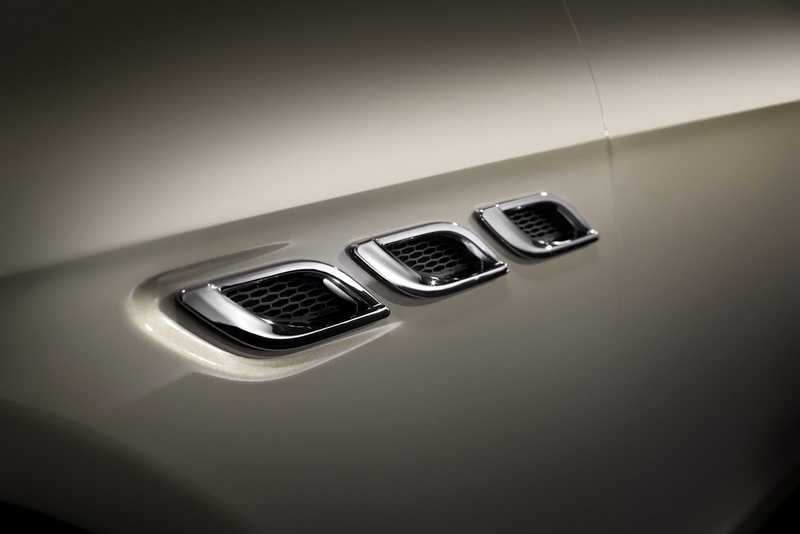 The Quattroporte has two intercoolers, each mounted low and wide of the main radiators to catch a constant supply of fresh, cool air. The engine also uses a state-of-the-art ECU, with integral high-speed processors, which handle an array of shifting functions in real time. Maserati Powertrain has also switched to on-demand ancillaries, with a variable displacement oil pump that works under electrical control for improved consumption and performance. It also uses an innovative, computer-controlled alternator, which monitors the vehicle's electricity consumption and manages the alternator's workload to suit. The engine also operates in both Normal and Sport modes, along with Manual versions of either mode, operated by elongated shift paddles fixed to the steering column. 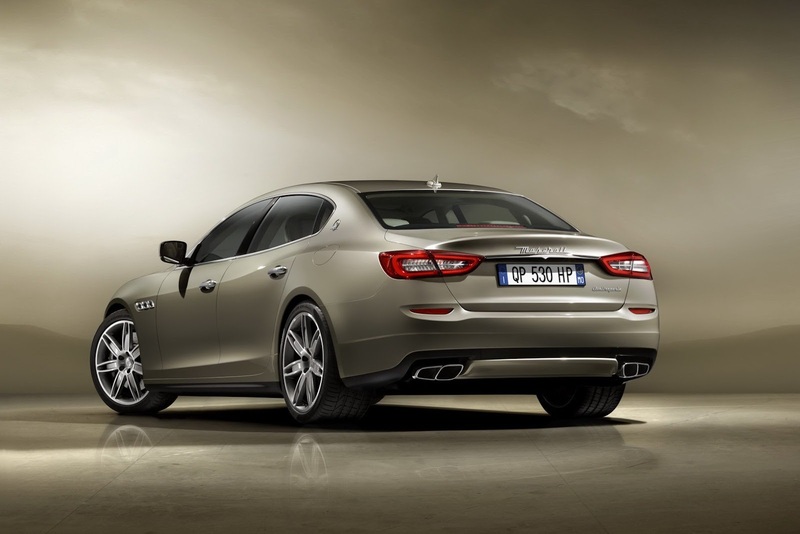 The new Quattroporte also introduces the I.C.E. (Increased Control and Efficiency) strategy, a function aimed at reducing consumption, emissions and noise. It is a user-select strategy and delivers a softer throttle pedal response for smooth driving, cancels the turbocharger's overboost function and keeps the exhaust's Sport flaps closed until 5000rpm. It also adjusts the gearshifts to make them softer and slower and reduces torque at each gear's take-up point. 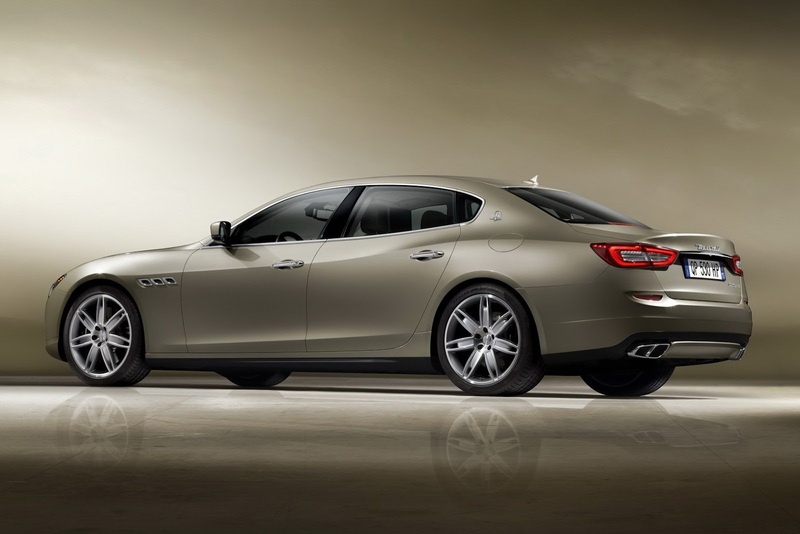 Besides delivering the Maserati Quattroporte's peak fuel efficiency figure, the I.C.E. mode is also very useful for driving on low-grip surfaces. 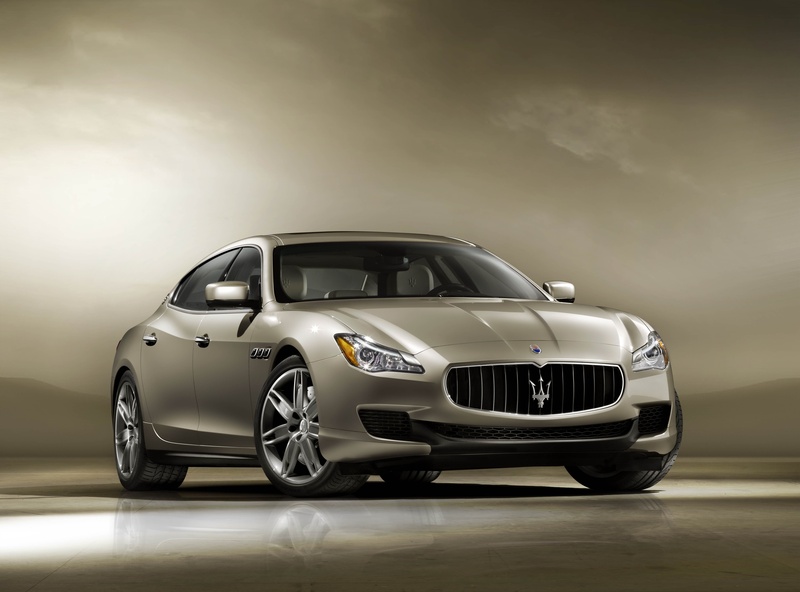 The Quattroporte's all-new V6 twin turbo engine is a close relation of the V8, sharing most of its core components. With 301kW (410hp) of power at 5500rpm, it still provides a tremendously powerful driving experience, especially with 550Nm of flat torque between 1500rpm and 5000rpm. In Normal mode the torque is smoothed at 500Nm in the lower rpm range, reaching the 550Nm threshold at 5000rpm to guarantee the 301KW of maximum power. The engine shares the V8's bore and combustion chamber design, the same valves control technology (i.e. roller finger followers and four cam phasers), the same twin turbocharging approach and direct injection-ignition system. The engine auxiliaries are identical (alternator, starter motor and power steering pump) or very similar (variable displacement oil pump). Nonetheless it has a character of its own, revving to a lower 6500rpm maximum speed and delivering its torque level of 500rpm sooner than the V8. While its specific power output is slightly lower than that of the V8, at 137hp per litre, its specific torque is actually higher than the larger-engined car's standard specific torque, at 183Nm per litre. It is also a lighter car, with 1860kg in its rear-wheel drive configuration (+70kg in all-wheel drive). In rear-wheel drive mode, it accelerates to 100km/h in 5.1 seconds, while the all-wheel drive V6 twin turbo manages the sprint in 4.9 seconds. Both cars are still as fast as people would expect from the Maserati brand, with the rear-wheel drive's 285km/h (177mph) top speed matching the outgoing Sport GT S and the all-wheel drive V6 twin turbo reaching 284km/h (176mph). The rear and all-wheel drive models are also very similar in their fuel consumption, with both cars posting 10.5 l/100km on the combined cycle, with the rear-wheel drive car claiming 244 grams of CO2/km and the all-wheel drive 246 grams. 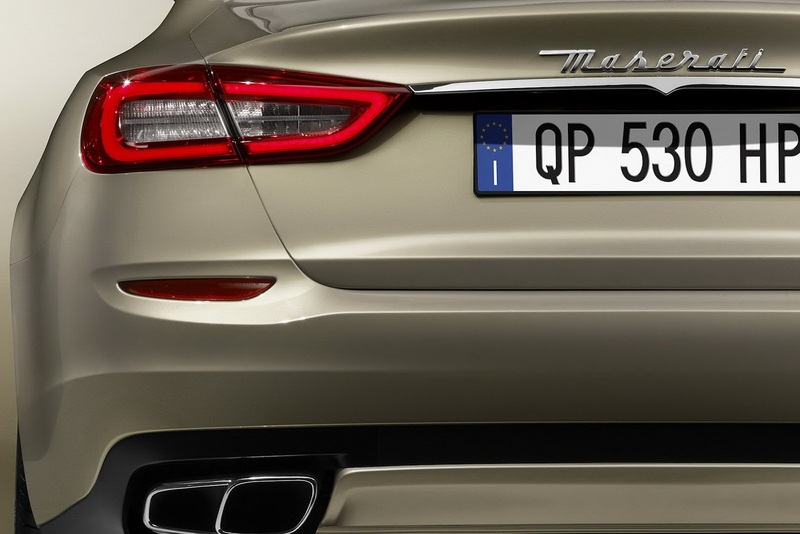 In the best Maserati tradition, the sound and performance of the Quattroporte's exhaust system is controlled by pneumatic valves in the pipes of each bank in order to maintain the classic and rich sound characteristic of the brand. In the default Normal mode, the bypass valves are closed up to 4,200 rpm to give a comfortable and discreet engine sound. In Sport mode, not only does the car adjust a variety of handling parameters, but the exhaust valves are opened, giving the shortest possible high-energy route for the exhaust gases. 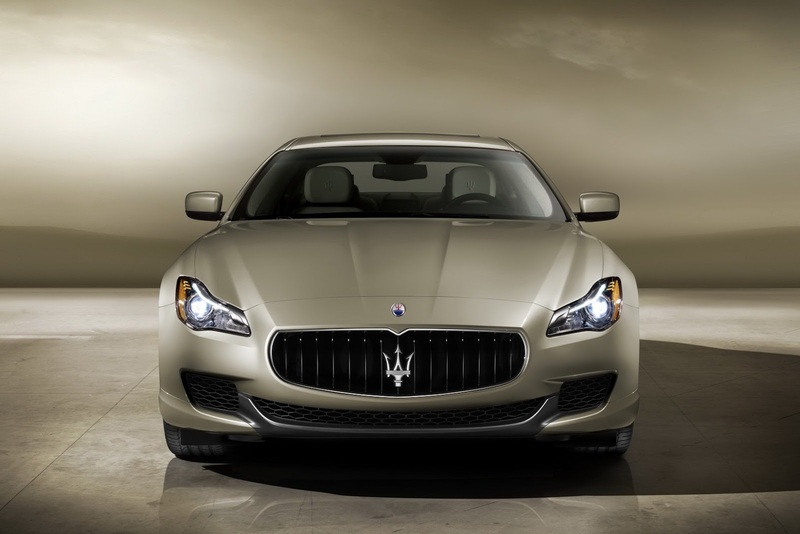 This gives the Quattroporte its maximum engine performance and the unique Maserati engine sound. Beneath the rear bumper, the V8 version finishes its exhaust system with trapezoidal tips with two double pipes in polished steel. 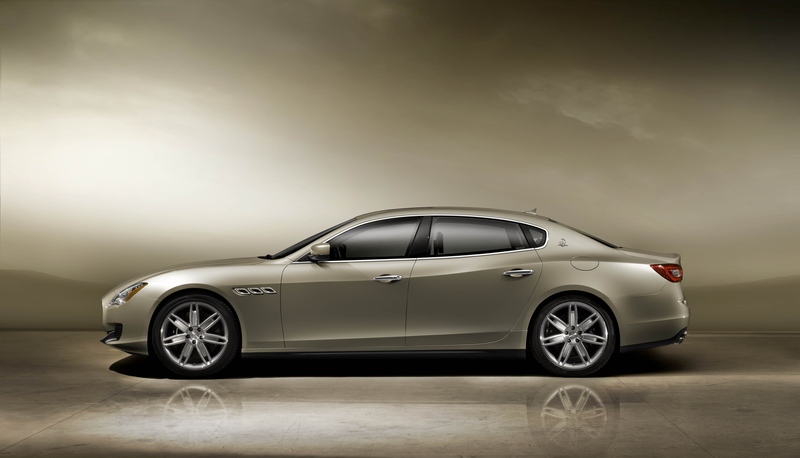 All versions of the new Maserati Quattroporte are fitted with the ZF AT8-HP70 eight-speed automatic transmission. Pre-engineered for both rear and all-wheel drive configurations, the transmission delivers increased comfort, faster gearshifting, reduced fuel consumption and reduced NVH (Noise, Vibration and Harshness) values compared to the six-speed automatic in the outgoing Quattroporte. By delivering two over-driven gears, the transmission alone delivers relevant fuel economy benefit and also weighs 4kg less than the outgoing six-speed transmission. Befitting Maserati tradition, it features five dedicated shift modes: Auto Normal, Auto Sport, Manual Normal, Manual Sport and the I.C.E. mode (Increased Control Efficiency). 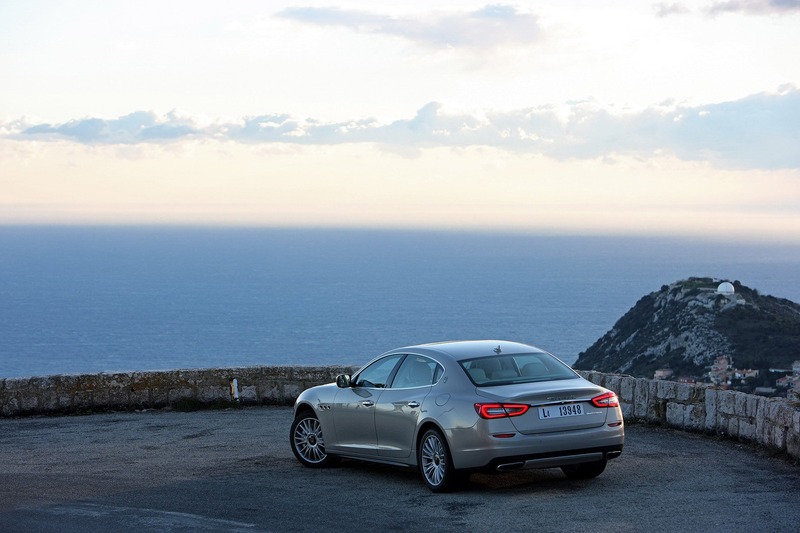 Auto Normal is the Quattroporte's default setting and performs its gear changes with fluid shifts at low engine speeds to emphasise the car's comfort and minimise fuel consumption. The Auto Sport mode sees the transmission switch character to change gears with greater alacrity at higher engine speeds and deliver a distinct gear engagement to enhance the powertrain's sporting feel. In both of these modes, the car recognises a variety of conditions, such as whether the car is travelling up or down hill or is braking hard or driving through a corner, and selects the best gear and the best gear-shift style accordingly. The transmission can also be controlled manually by selecting the M button on the transmission tunnel. In Manual Normal mode, the driver can change gear with either the elongated gearshift paddles attached to the steering column or by using the transmission lever. The driver is in charge of the gear selection, though the system will intervene and change to a lower gear if the engine revs drop too low, or change to a higher gear if the engine revs climb too high. In Manual Sport mode, however, the gearshifts are at their fastest and crispest, giving the driver full control of the powertrain. The system will not intervene, even if the driver strikes the engine's rev limiter. It will only intervene if the engine's revs drop too low to be effective in a given gear. The I.C.E. (Increased Control Efficiency) mode is designed for remarkable fuel economy, relaxed driving and extremely low grip conditions. The transmission changes gear as softly as possible, both going up through the gears and returning back down. All gearshift modes can be selected via buttons on the left of the gear knob. 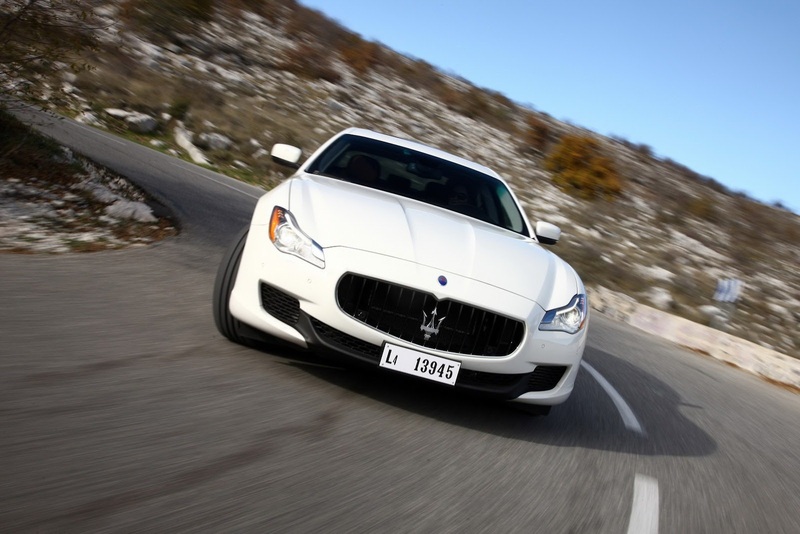 The Maserati Quattroporte also utilises a mechanical limited-slip differential. The asymmetric locking feature offers 35 % lock-up under power and 45 % under release. The rear differential is driven via a two-piece, 80mm diameter steel propshaft (hollowed for weight saving) with two constant velocity joints and one head rubber coupling, for comfort improvement. The propshaft runs through a cross member-mounted rubber bearing for higher comfort in respect to vibrations and harshness levels. The completely brand new AWD transmission is compact, efficient and light weight. The all-wheel drive system is capable of switching the powertrain torque from full rear, to split axles, rear and front, almost instantly (150ms). The smart logic of the system provides the vehicle with the optimum torque split, thus guaranteeing maximum stability in all driving conditions. 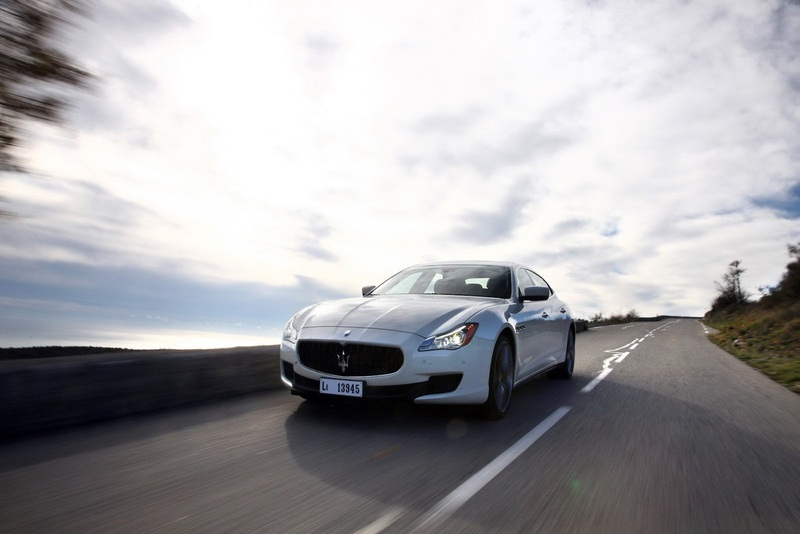 From the Quattroporte AWD you can expect maximum performance and enjoy maximum traction torque and safety: the system is able to work in team with the ESP for maximum safety even on the most slippery of surfaces, but at the same time is able to operate independently, preserving driving efficacy and sportiness within limits of safety. The sensors in the car's body and the AWD CPUs will monitor all vehicle functioning parameters, reacting to each event specifically. The driver can monitor these functions by looking at the display where the front-rear torque split is visible. When the vehicle is running at sustained high speed, the CPU sets all the torque to the rear axle for maximum efficiency and transmission longevity, but then it is always ready to react to ensure optimum safety. In addition, the AWD system is mechanically designed to deliver the lowest level of operating noise, and maximum performance. 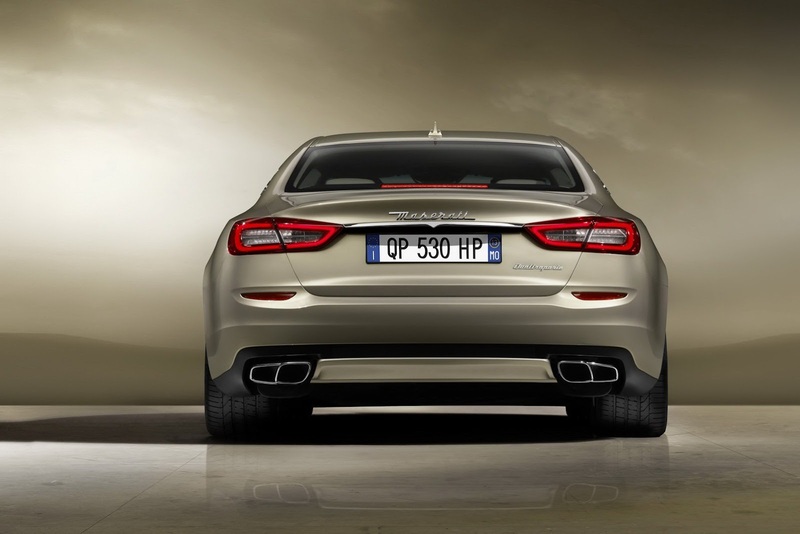 The chassis of the new Quattroporte has been designed to meet the performance and comfort demands of Maserati buyers, as well as all foreseeable safety regulations. 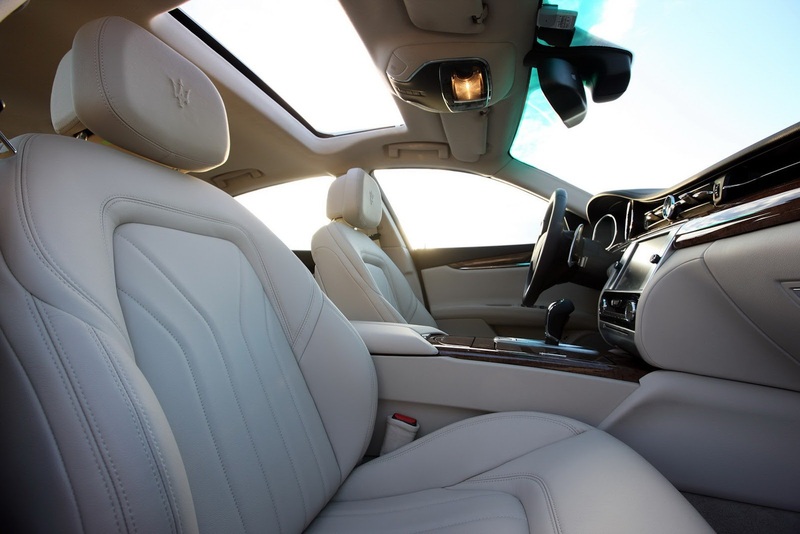 With the longest wheelbase in its class, the Quattroporte's architecture lends itself both to extreme interior comfort and an exciting handling platform. Based around a rigid and extremely secure steel safety cell, it uses an array of different steel and aluminium alloys, each designed to maximise strength, minimise weight and retain the sports saloon's perfect weight distribution. The front of the chassis is based around an aluminium sub frame and a reinforced cross-strut to deliver outstanding rigidity. 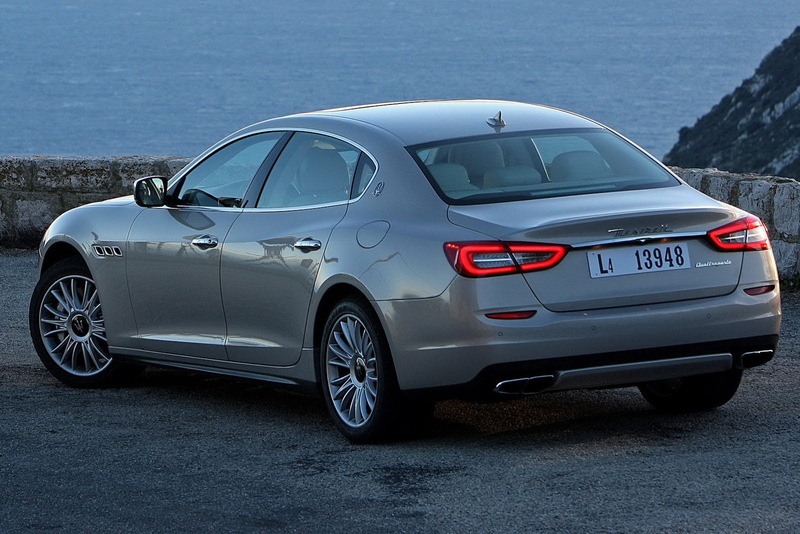 The choice of aluminium for the bulk of the Maserati Quattroporte's body panels guarantees the maximum occupant safety with the lowest possible weight. Accordingly, all four doors, the bonnet, the front wings and the boot lid are all made from aluminium. 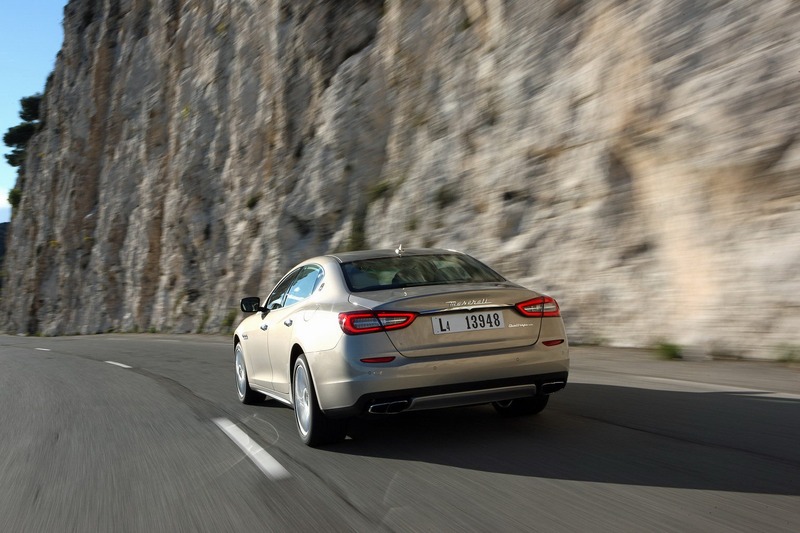 Along with the freedom it allowed Maserati's designers, the choice of aluminium has also had a positive impact on reducing the Quattroporte's weight, thus lowering its fuel consumption and emissions. 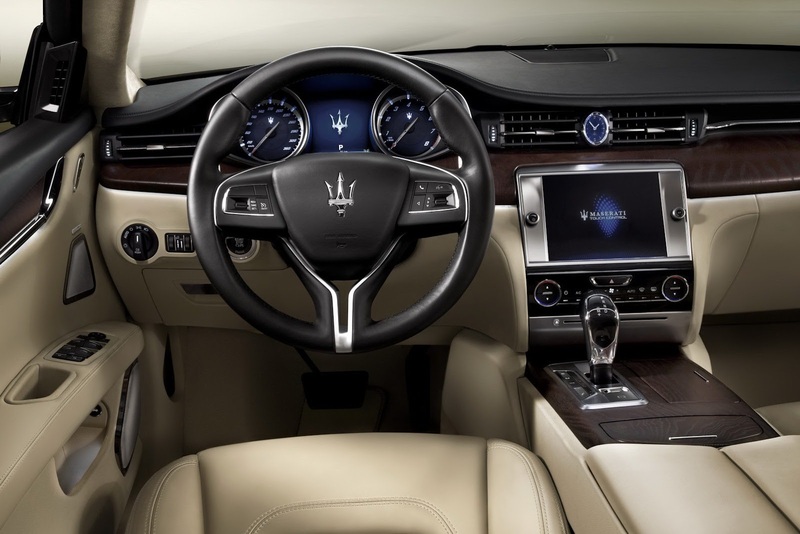 Other diverse materials are also used in the Quattroporte's body, including ultra-light weight magnesium, which is used in the dashboard's cross strut. The modifications to the Quattroporte body design aren't just about looks, but have also allowed for a 12% improvement in drag (Cx), now down to 0.31, and an enormous 24% reduction in lift. These figures reduce fuel consumption and increase high-speed stability. 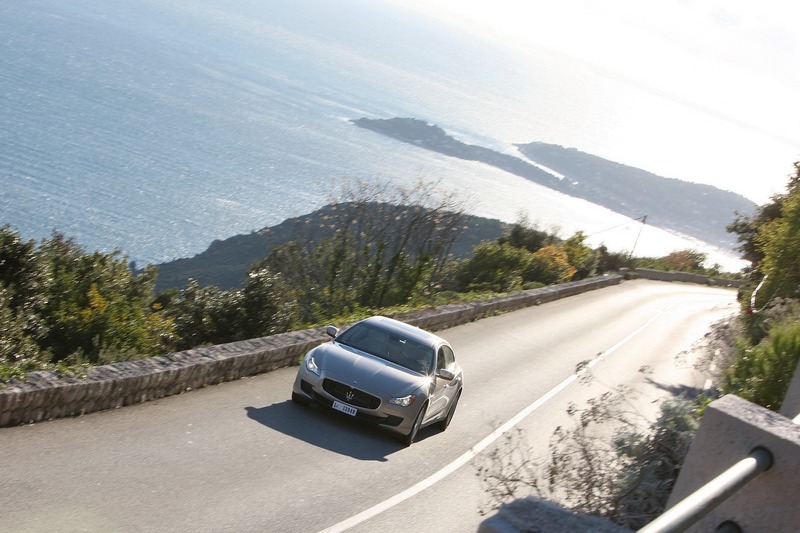 The Quattroporte has gone through extensive aerodynamic work, most of which is out of sight, beneath the car. It has a flat floor that contains several aerodynamic features, including a NACA duct to help cool the differential without increasing drag and flaps on the rear suspension arms to channel airflows. Double wishbone suspension layouts are a race-bred tradition at Maserati and the new Maserati Quattroporte continues with this heritage, also incorporating some new technology for greater driving precision. The front suspension uses high-mounted, all-aluminium double wishbones to guarantee light and precise handling characteristics. Aluminium is the dominant metal of the front suspension system with the shock towers, the upper and lower control arms and uprights all made from forged aluminium, while the springs are made of steel. All of these match up to constantly adaptive Skyhook dampers and an anti-roll bar. The quadrilateral architecture of the system has enabled Maserati's handling team to deliver steering that is precise, communicative and comfortable. The rear suspension employs a five-bar multi-link system, with four aluminium suspension arms, and has been developed to achieve the apparently conflicting goals of exceptional comfort and extreme sports performance. The suspension package also uses anti-roll bars and steel springs damped by a faster and more accurate development of the Skyhook adaptive damping system. All four Skyhook dampers can be electronically controlled independently of one another. One of the standout features of the new Quattroporte, the default Skyhook mode prioritises comfort and then becomes more sporting and athletic if the driver presses the suspension button. This extra stiffness transforms the Quattroporte's handling and was developed in both extreme test scenarios and on the race track. 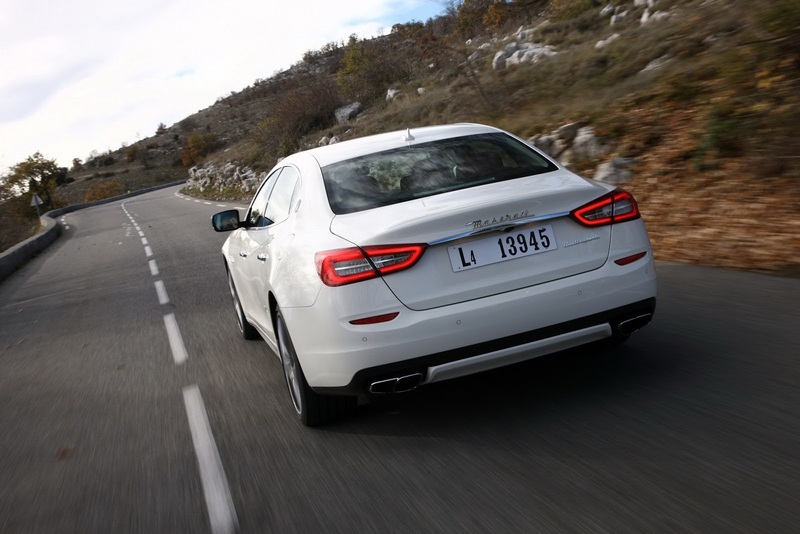 Essentially, it drastically reduces both lateral and longitudinal load transfers and minimises body roll to bring out the sportiest side of the Quattroporte's character. The computer system in charge of the Skyhook dampers monitors an enormous array of parameters, including speed and lateral and longitudinal acceleration, individual wheel movements, body movement and damper dynamics. Adjusting also to suit the suspension mode chosen by the driver, the system delivers the perfect damping mode for each wheel almost instantly. 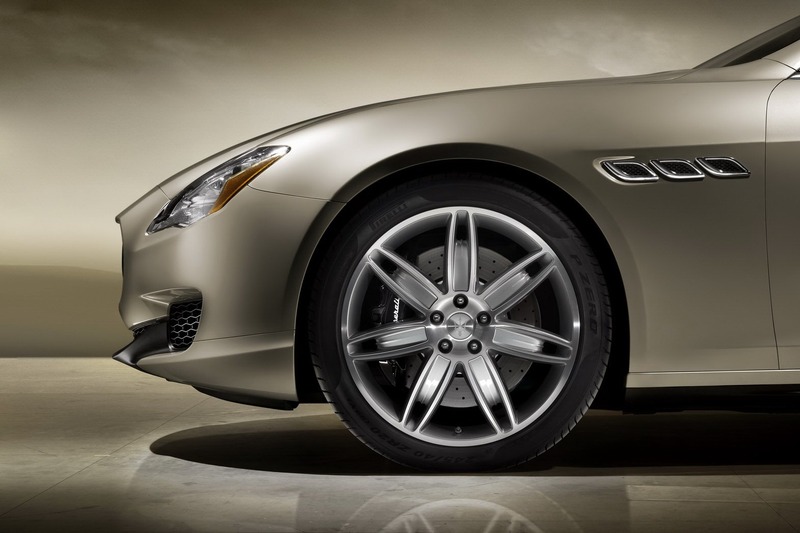 Featuring 20-inch rims as standard equipment, the new Quattroporte is also available with either smaller 19-inch rims or larger 21-inch rims. The 19" and 20" alloys are crafted from flow-forming technology which reduces the core thickness of the wheels and optimises light weight, without sacrificing stiffness and strength. The 21" rim is a forged alloy wheel, which also emphasises light weight and weighs no more than the 20" rim. 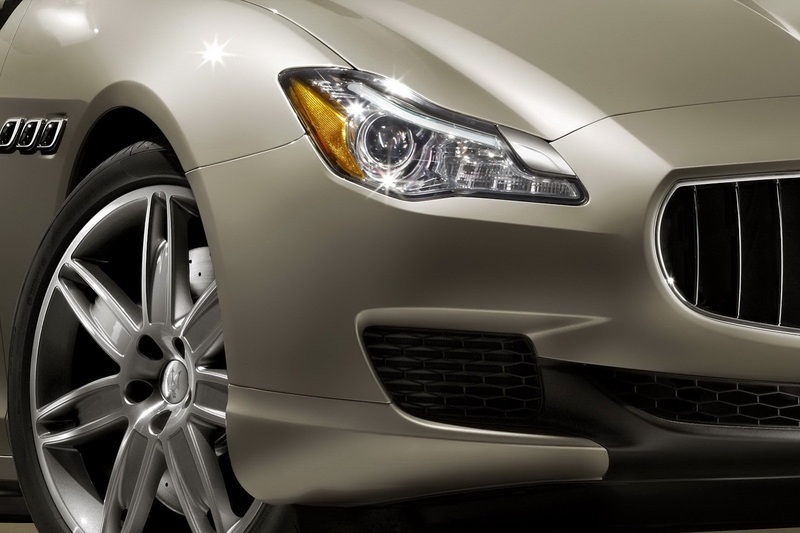 All the Maserati Quattroporte's rims have been designed and engineered to enhance the visual design of the body and to lower the unsprung masses to improve grip and handling. The 19" wheels, with 245/45 front tyres and 275/40 rear tyres, are geared towards reduced fuel consumption combined with low road noise and long, comfortable journeys. The 20" wheels, with 245/40 front tyres and 285/35 rear tyres, are the perfect compromise between sportiness and comfort, while the 21" wheels, with a 245/35 front and 285/30 rear tyre combination, are focused on sports handling. All three wheel sizes are available with Pirelli, Dunlop and Continental tyres. The 19" and 20" wheels can also be fitted with winter tyres. Additionally, the Quattroporte continuously monitors its tyre pressure with a sensor mounted inside the rim, as part of the valve. The pressure can be read off the display on the dashboard. If a tyre punctures or its pressure changes, the system notifies the driver with visual and acoustic warnings. 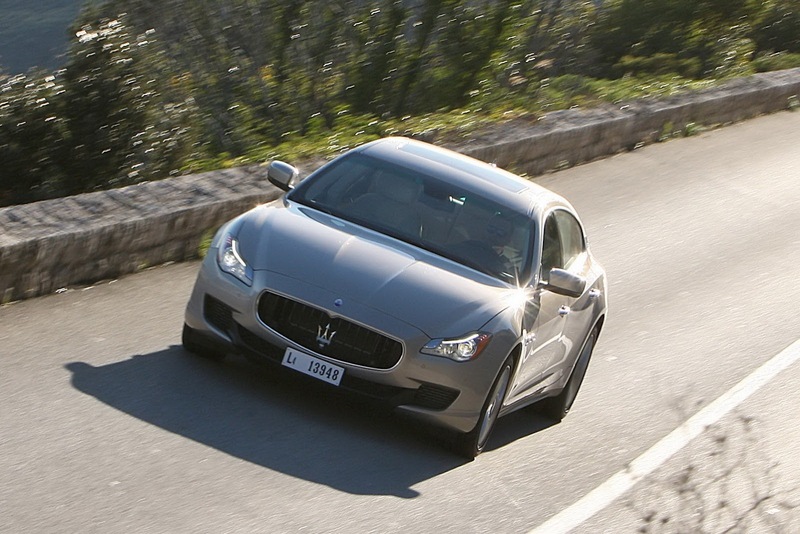 The new Quattroporte has grown to set size benchmarks in its class in almost every dimension. 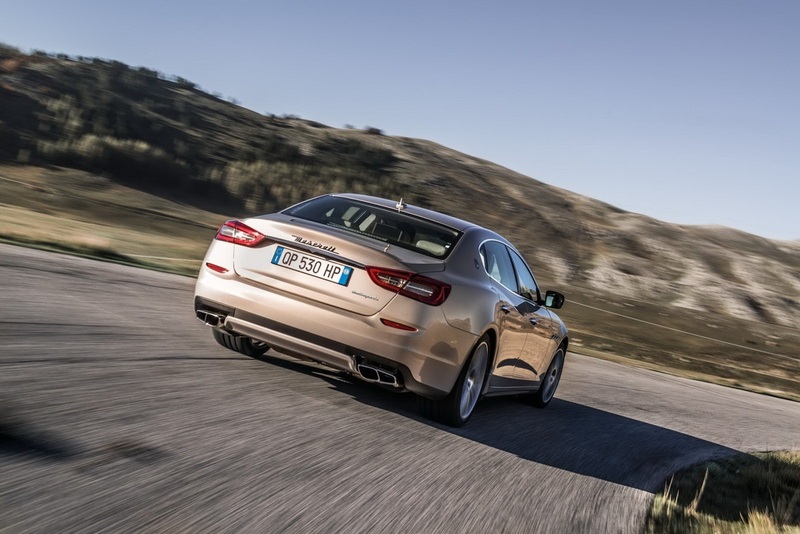 It is bigger in every significant dimension than its predecessor including delivering 105mm more rear legroom and 80 litres more luggage capacity than the outgoing Maserati Quattroporte. 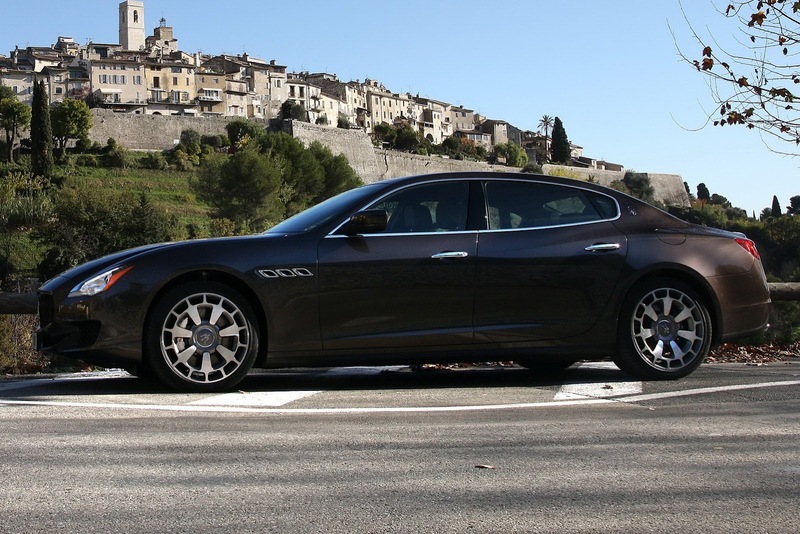 Most importantly, these increases have not created a similar rise in mass, with the Quattroporte weighing almost 100 kg less than the flagship predecessor, (1900kg in V8 form). 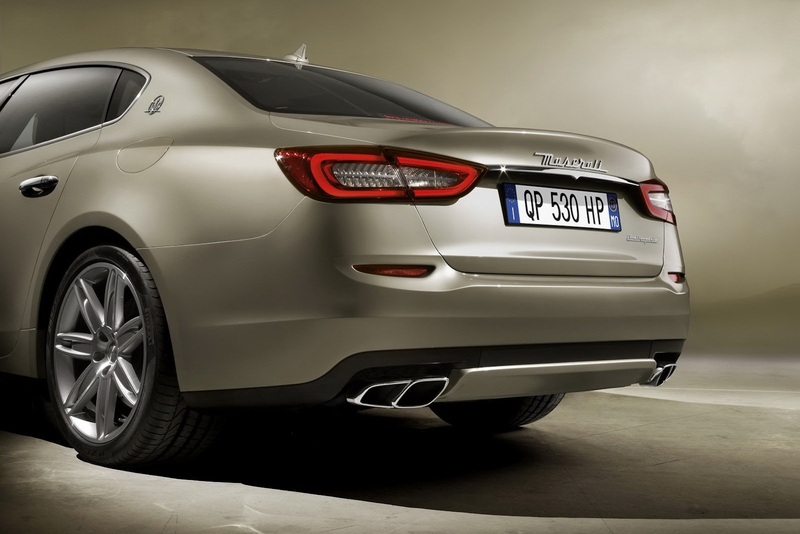 Another vital factor is weight distribution and consequently the Quattroporte retains perfect balance with 50:50 front-to-rear weight. This is despite the forward repositioning of the fuel tank to create greater luggage space and the addition of all-wheel drive, bigger radiators and two intercoolers beneath the bonnet. Maserati has continued its long lasting partnership with Brembo on the new Maserati Quattroporte and all models feature fixed-caliper braking technology. The V8-powered models feature 380mm x 34mm ventilated and cross-drilled brake discs inside the front wheels. These brake discs continue to use the technology pioneered by Maserati, which allows the weight of the cast-iron braking surface area to be offset with an alloy hat to minimise unsprung mass. As with the V6 models, the V8's front discs are slowed by six-piston fixed alloy Brembo calipers. The rear end of the Quattroporte V8 uses 350mm x 28mm ventilated and cross-drilled brake discs, with four-piston fixed alloy Brembo calipers. These brakes, with an enlarged swept area and highly efficient cooling, are designed for consistent performance in sports driving situations. 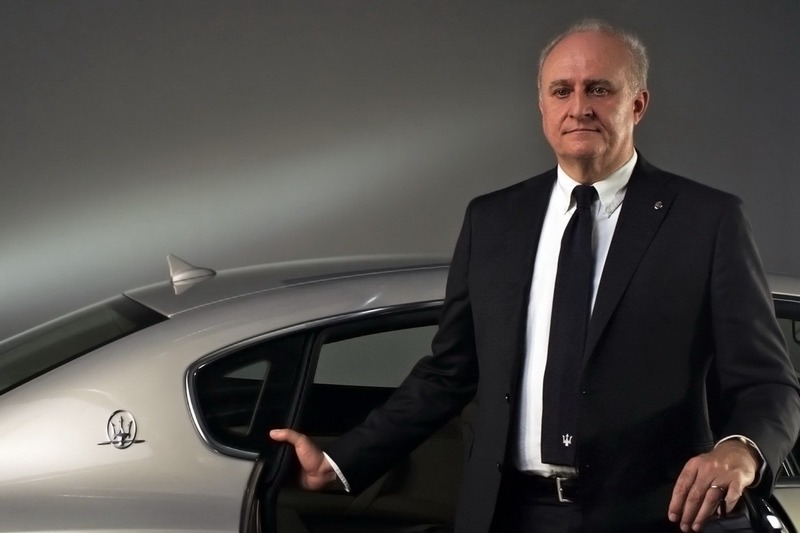 They are also bigger in order to respond to the demands created by the extremely high performance potential of the new Quattroporte. The brakes on the V6 twin turbo Quattroporte models are only marginally smaller than the V8 twin turbo's brakes - 360mm x 32mm ventilated and cross-drilled brake discs, with six-piston fixed alloy Brembo calipers on the front axle and carrying over the V8 twin turbo's rear braking hardware. However, high-performance stopping power is only one measure of overall braking performance. The collaboration with Brembo has also concentrated on evolving the acoustic comfort of the Maserati Quattroporte's braking systems. The Quattroporte also uses an electronic parking brake, which operates on all four wheels. The ergonomically placed button on the gear lever bezel activates the brake when the car is at rest. It can also act as a safety device when driving. In this case the system communicates with the stability control ECU and decelerates the car at 0.5g in full safety until released. 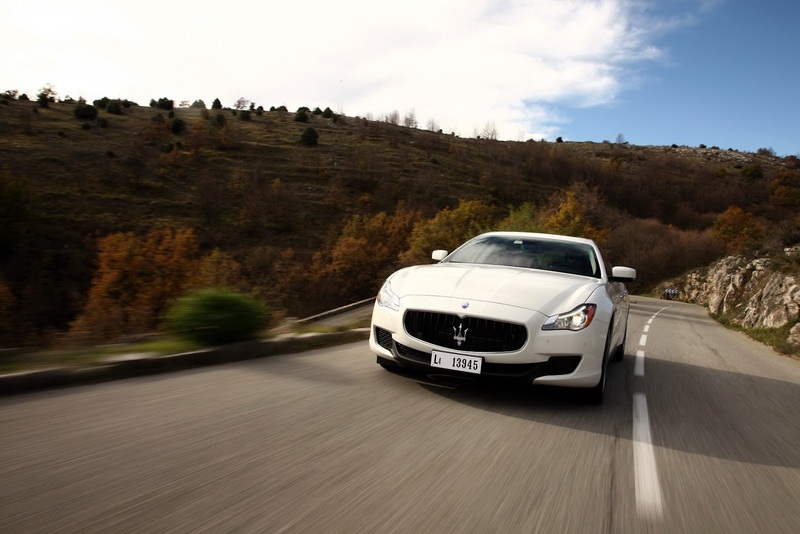 The brakes also operate as part of the Quattroporte's automatic hill starting system. The on-board sensors detect the vehicle's tilt when parked facing uphill, then lock the brakes for a few seconds; this gives the driver's foot time to move from the brake to the accelerator pedal without the vehicle rolling back. Besides their strength and effectiveness, Maserati brake calipers have also always added a significant stylistic effect. 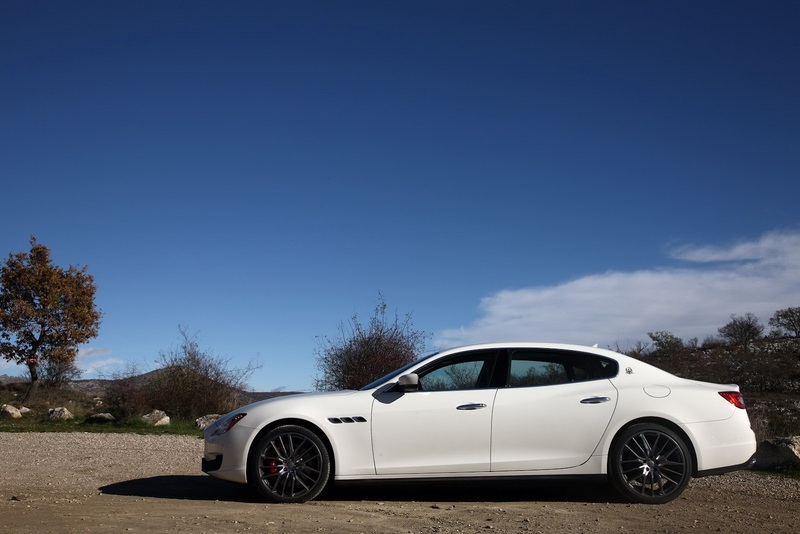 This continues with the new Quattroporte, with the front and rear brake calipers available in the standard classic black with the Maserati name in white. These are also available in red, blue, silver and polished aluminium. The Maserati Quattroporte uses an all-new aluminium steering box, developed specifically for the new front-suspension geometry. This has allowed Maserati's suspension engineers to deliver ultimate precision combined with the steering sensitivity needed for turning into corners at speed. Its reduced steering ratio delivers an agility that is rare for this class of luxury saloon and while it is comfortable in all situations, the steering feel is geared towards driving enjoyment. 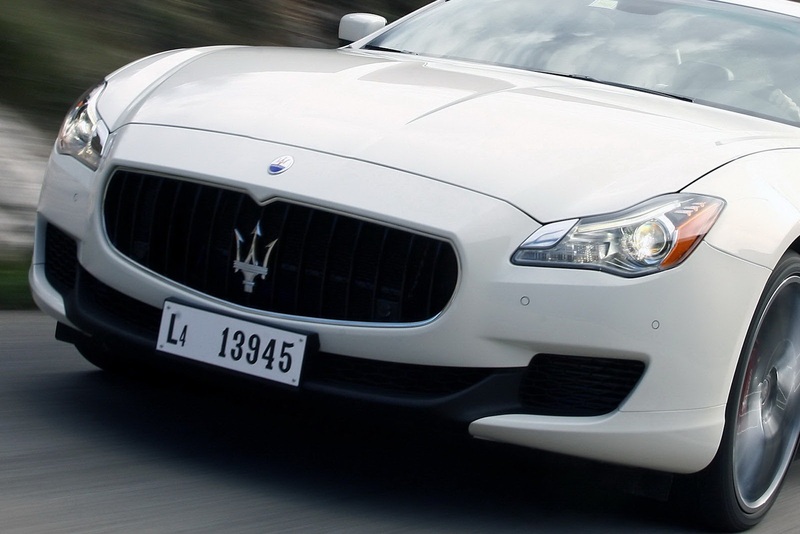 Avoiding electro-hydraulic steering systems, the Quattroporte employs a servo-powered hydraulic system that prevents artificial assistance when the driver turns the wheel quickly. 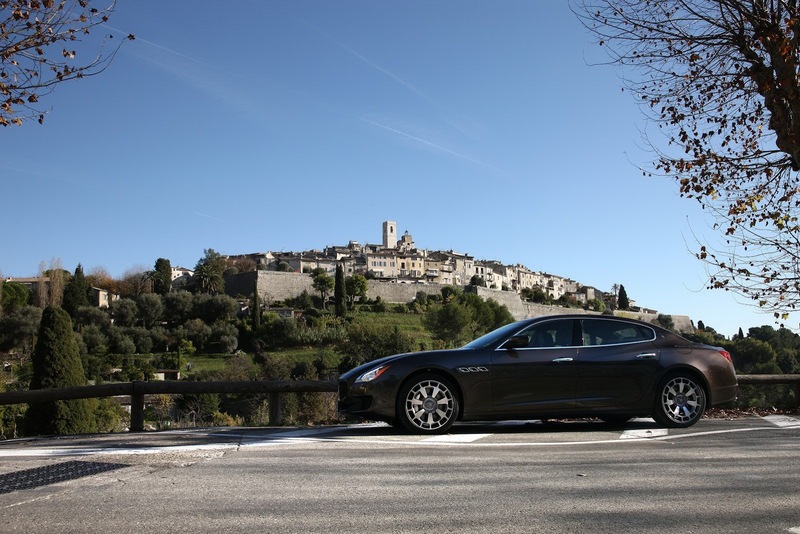 The power assistance has also been reduced compared to the previous Maserati Quattroporte; the intention being to deliver more feedback to the driver for consistency at high speed, yet maintaining easy manoeuvring at low speed. 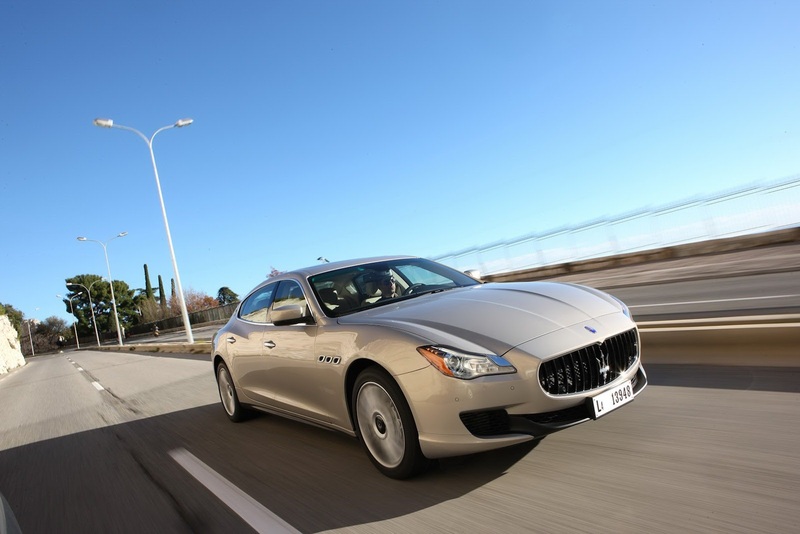 Maserati drivers have long known the benefits of the Maserati Stability Programme (MSP) and the system has evolved and improved in the new Quattroporte. Developed in the most extreme of test circumstances, the MSP uses a wide array of sensors to detect any need to intervene on the driver's behalf. 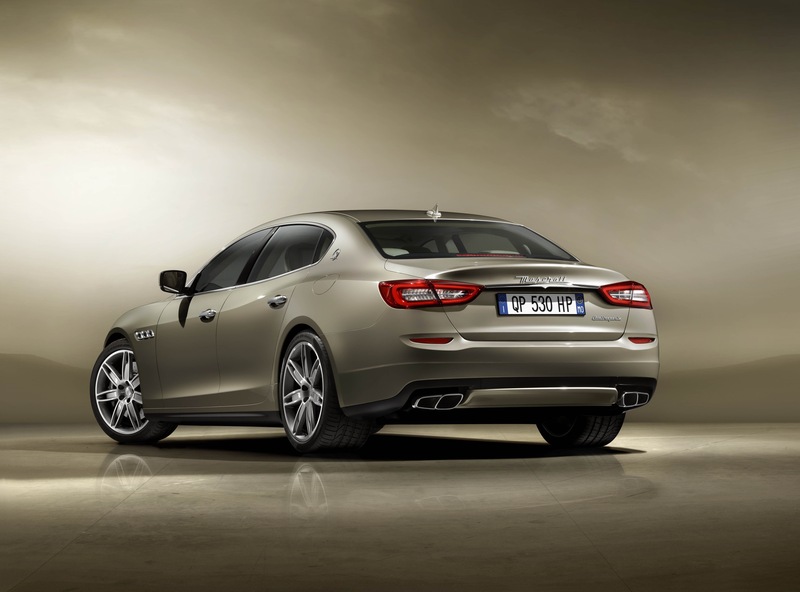 MSP adds a layer of security on top of the new Quattroporte's inherent chassis stability which helps drivers enjoy anxiety-free handling under all driving conditions. 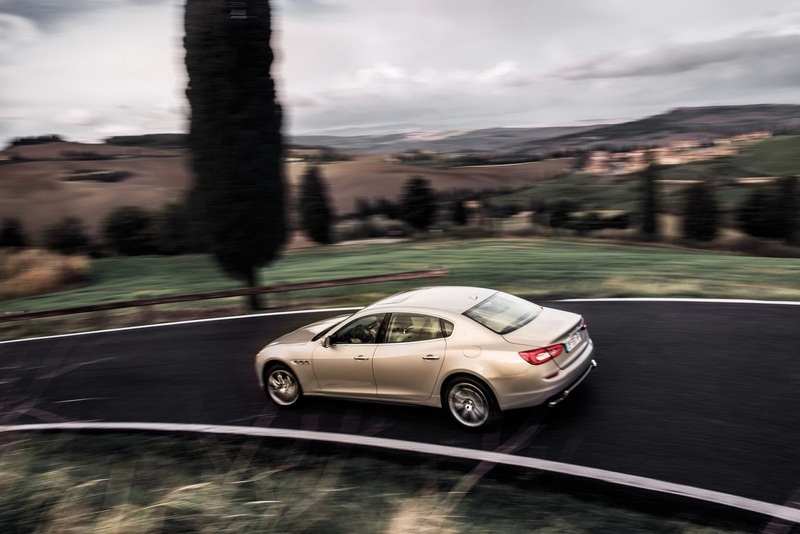 MSP constantly measures the Quattroporte's handling and grip and combines a host of safety and performance systems to maintain the car's ideal handling stance. The MSP most common areas of intervention are the engine and the brakes. If skidding is detected, the MSP reduces the engine's torque output and can actuate the brakes with minute, finely varied inputs to restore the car's stability within milliseconds. ABS - stops the wheels locking up under brakes, thereby maintaining steering control at all times. EBD (Electronic Brake Force Distribution) - distributes braking force between the front and rear axles to prevent rear-wheel lock up. ASR (Anti-Slip Regulation) - stops the driven wheels from spinning in low-grip situations. MSR - prevents the driven wheels from locking up when down-shifting on low-grip surfaces. It does this by measuring the speed of the driven wheels against the speed of the free wheels and accelerating the driven wheels slightly if needed. BAS (Brake Apply Sensor) - uses a variety of sensors to recognise panic or emergency braking situations and increases the pressure in the braking circuit. Hill Holder - automatically connects to the braking system to prevent roll back when the car moves away from rest on hills. The new Maserati Quattroporte's passive safety equipment has been given a tightly focused overhaul to successfully improve its crash safety, without compromising its weight or fuel consumption. Maserati has balanced these conflicting demands by using hot-formed steels in critical areas of the passenger compartment for added occupant safety, while using aluminium in other areas to save weight. For example, the front of the passenger compartment (the pillars and under-door mouldings) features hot-moulded steel components, with a magnesium dashboard strut to save weight, while the rear is stiffened with high strength steel. The crash bars at the front and rear of the car are made of extruded aluminium, while the doors, engine compartment, mudguards and luggage compartment are in aluminium. 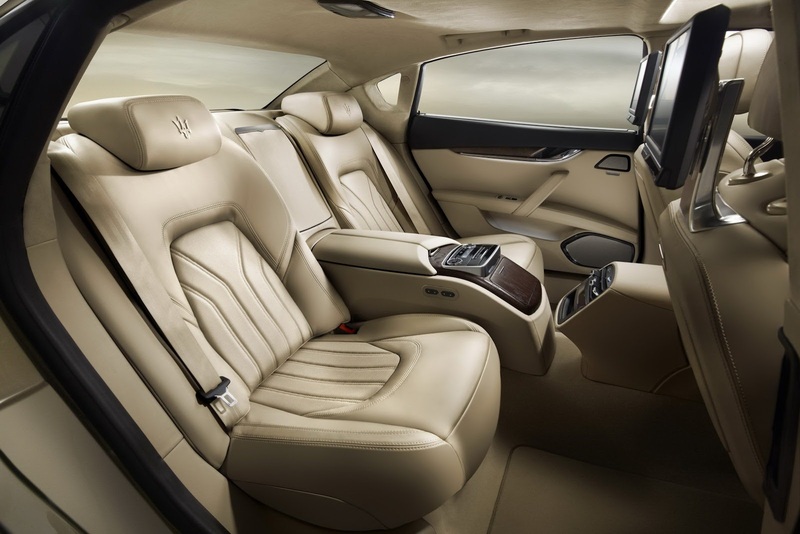 The New Quattroporte is equipped with a six-airbag system to provide maximum occupant safety. At the front, two-stage airbags are concealed from the occupants inside the steering wheel and dashboard to protect the head in case of a frontal impact. The chest and hips of the front occupants are further protected by the side airbags located in the seats. The sides of the occupants' heads are protected by two "curtain" airbags mounted in the roof of the car, next to the B-pillar. The "curtain" airbag protects the heads of the front and rear occupants against lateral impact. The front seats feature excellent integrated safety equipment designed to reduce trauma to the occupants' cervical vertebrae. If the car is involved in a rear-end accident, its active headrests automatically reduce the distance between their surface and the occupants' heads. The front and rear three-point seatbelts are equipped with load-limiting pyrotechnic pre-tensioners, which trip in a collision to hold the passengers securely and prevent or minimise injury. The front seatbelts are fitted with height adjusters; properly adjusting the height of the seatbelts to the occupant's height, which is not only more comfortable but also improves the safety function of the device. 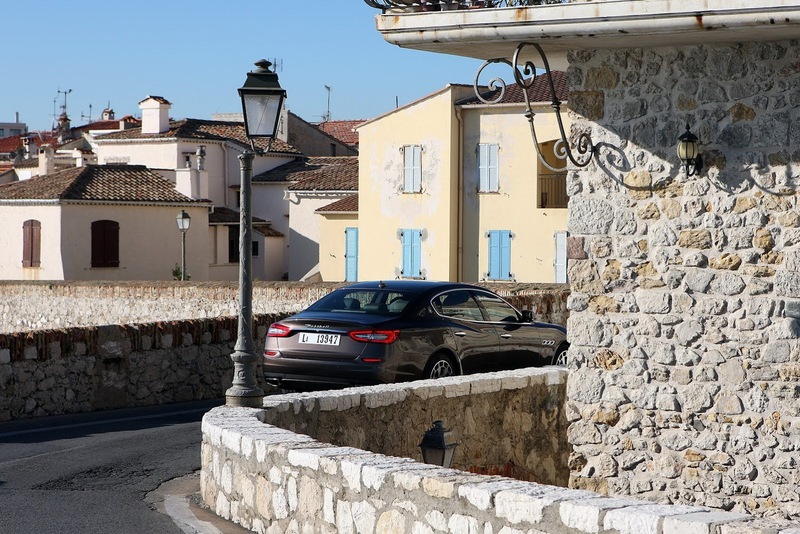 The rear-view parking camera, standard on the new Maserati Quattroporte, makes manoeuvring and reversing safer and more comfortable. Installed next to the luggage compartment's release button, it views the area behind the car and shows the resulting colour image on the 8.4" MTC display. The system works together with the standard parking sensors and an acoustic warning can be heard as it approaches obstacles behind the car. 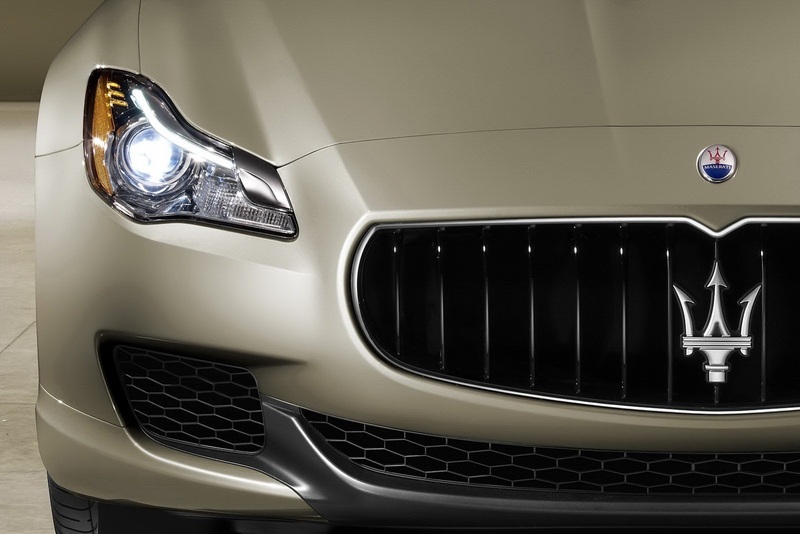 The Quattroporte's exterior design is so distinctive partly due to its Bi-xenon headlights and LED daytime running lights. The LED tail light assembly is also highly innovative, providing excellent visibility as well as the style and safety essential to this class of car. The standard headlights contain an Automatic Frontlighting System (AFS), which actively adjusts the headlight depth to combine an outstanding view of the road with very low glare for oncoming traffic. The bi-xenon headlights combine technology and style, while all of its secondary functions are provided entirely by LED. Each headlight includes LED daytime running lights, with a light shape that provides instant recognisability in both day and night running. Each light also contains a high-pressure lens washer nozzle, direction indicators, LED side position lights and a side reflector. With a video camera mounted in front of the rear-view mirror, the lighting system offers a beam control specifically for motorway driving. This increases the depth of the light beam, without the need for manual high beam activation. Sensors monitor the driving style and speed and, if the road is clear, the beam depth offers the maximum depth and width combined with the directional rotation of the headlights themselves. In addition, there are four different automatic lighting setups: for city driving, motorway conditions, low visibility and for driving on the opposite side of the road in applicable countries. Each of these modes automatically activates a strategy to best illuminate the road surface. The town beam turns on below 45km/h and sets the beam wider and shallower, giving a better view for turning and for peripheral danger zones, whilst causing minimum disturbance for fellow road users. There is also a rain beam, which comes on when the windscreen wipers operate for a continuous period. The individual beams are set to different levels to minimise reflections, while the outer beams are set wider and higher to make the Maserati Quattroporte more visible to other road users. Note: In the USA and Canada, cars are not equipped with the AFS function. They retain the automatic depth and rotation control functions. The beam rotation function and the four AFS functions may be deactivated via the menu in the European Union, whilst in the USA only the beam rotation function may be deactivated in this way. 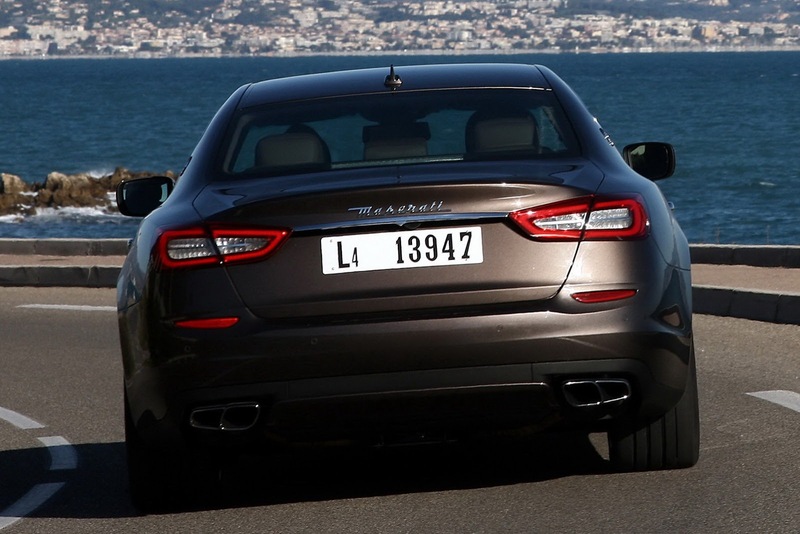 The Quattroporte's tail lights have been designed to offer maximum visibility and to have a recognisable style. These full LED lights integrate the position light function in an illuminated ring running right around the tail light itself. Inside this ring are the brake lights, the direction indicators, reversing lights and fog lights. The outside reflector and LED side position lights round off the unit. The interior of the new Quattroporte combines refined, timeless design with high technology and a functional sporting character. 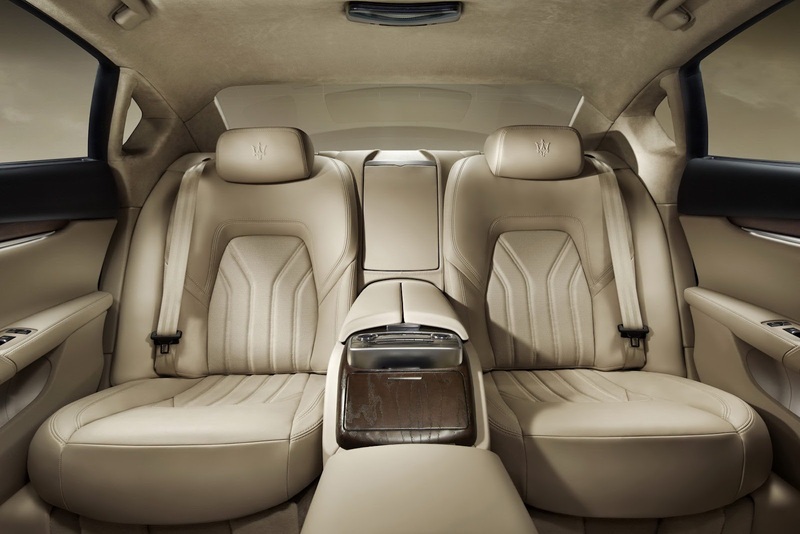 The increases in the size of the Maserati Quattroporte have brought a huge evolution in roominess for the front and especially the rear passengers. Its increased wheelbase has allowed Maserati to add more rear legroom, more shoulder room for all passengers and more luggage capacity. "The interior achieves elegant simplicity, with clean lines and a user-friendly interface" Mr Tencone said, " assuming that less is more when carefully designed". "The functional features are downplayed to focus the attention on the top class natural materials - wood, leather, metal - and the refined craftsmanship with which they have been worked". "The combination of classy and elegant colours makes the interior an exclusive lounge for the occupants that can become unique with a tailored approach for each customer". Confirming Mr Tencone's views, the Quattroporte's interior shows streamlined, wraparound forms, which give the dashboard and tunnel an unprecedented feeling of lightness. 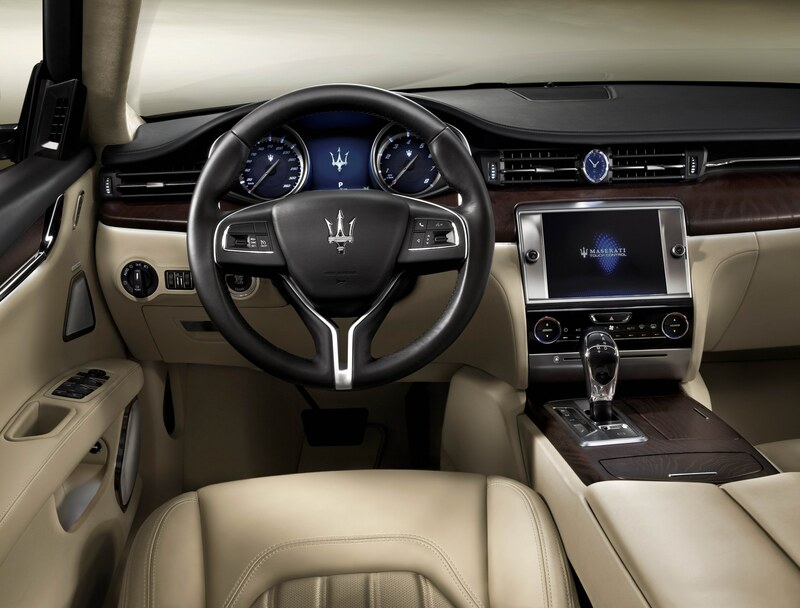 Like all Maseratis, the Quattroporte features a driver interface that is intuitive and simple to use. The instrument cluster has a large speedometer and a large tachometer that flank a 7" TFT display used for many of the car's operational features. The leather-finished steering wheel is electrically adjustable for both reach and height, while the pedals are also adjustable (LHD cars only), moving towards the driver at the touch of a button mounted at the front of the driver's seat. 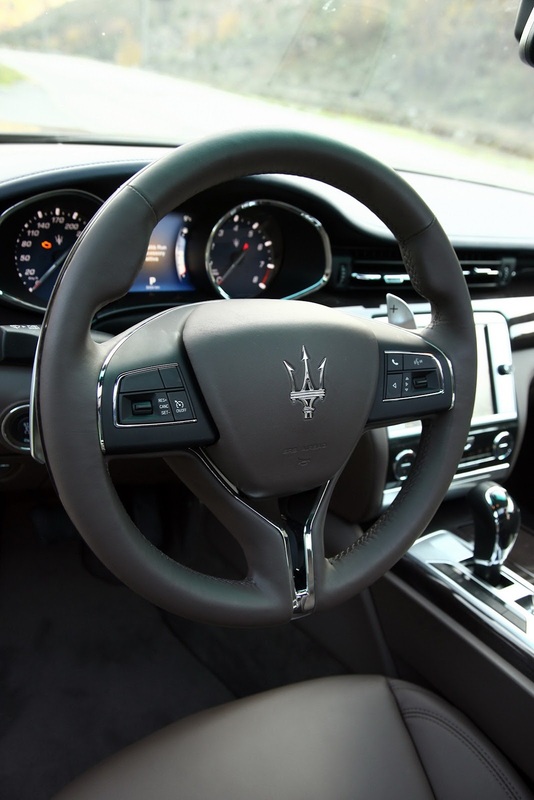 Many of the vehicle's settings are oriented towards the driver and are controlled with the buttons alongside the gear shifter, while other on-board settings can be set by the driver via the Maserati Touch Control (MTC) at the centre of the dashboard. 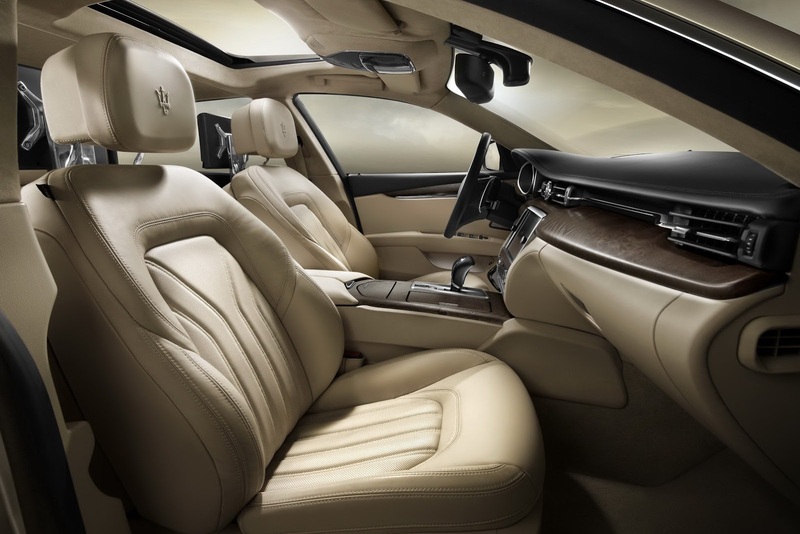 The Quattroporte standard equipment includes leather, heated front seats with 12-way electrical adjustment, dual-zone climate controlled air conditioning and active cruise control, while the upper and lower dashboard and the interior upholstery are wrapped in Poltrona Frau leather. 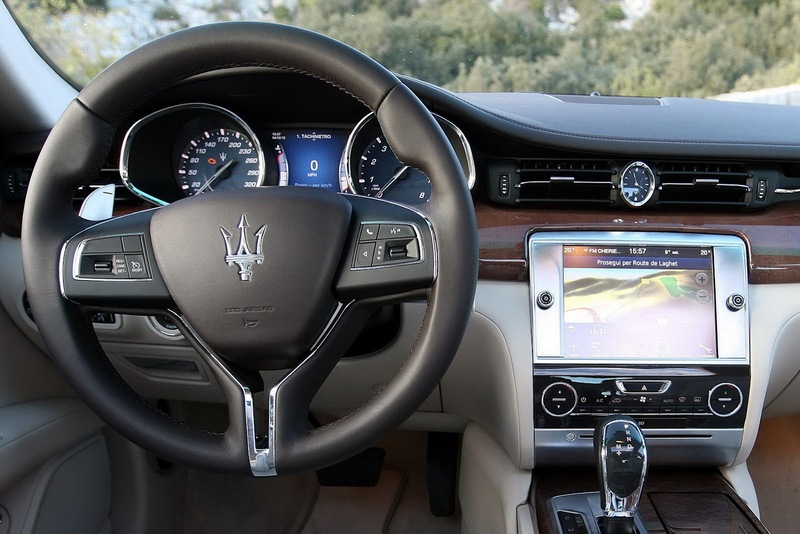 By utilising the MTC's 8.4" Touch Screen display, the user can control almost all of the Maserati Quattroporte's on-board equipment simply and intuitively. The system includes radio, satellite navigation and DVD player. It also has Bluetooth connection to connect to external sources like mobile phones and Apple devices. Using its Aux-in, USB sockets or the SD card reader, the user can play music, watch films or even view images. Its menus have options to configure the car's main settings and the system's various menus are always available from the icons displayed at the bottom of the screen. The MTC also controls the front seat heating and ventilation, the steering wheel heating and the operation of the rear window shade, as well as providing the screen for the reversing camera. 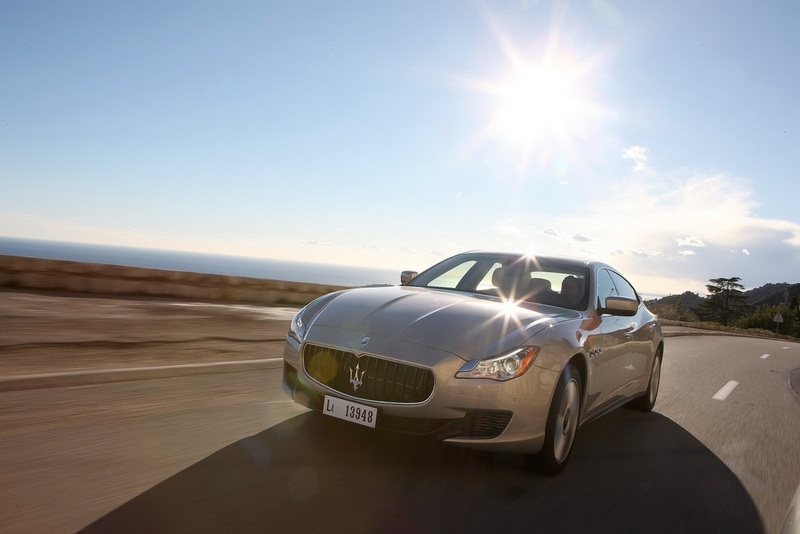 An active cruise control system is standard on the new Quattroporte. The controls for this system are mounted on the steering wheel and the speed is shown on the instrument panel display. 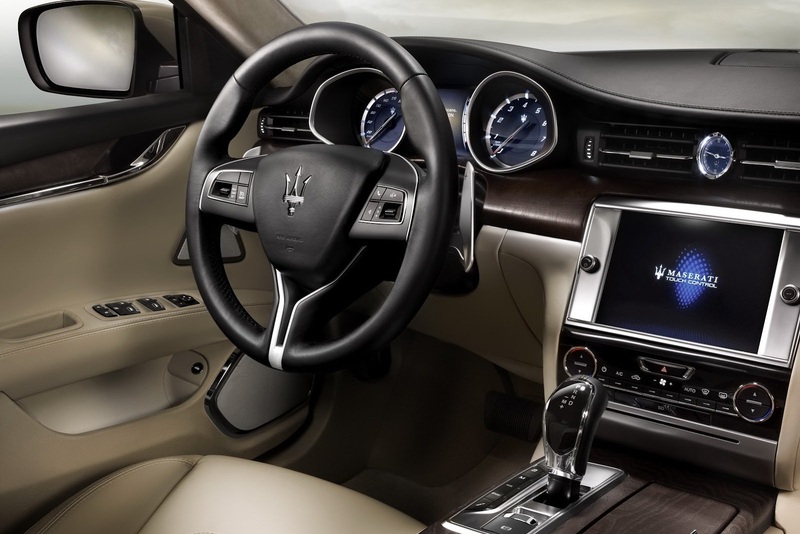 The new Quattroporte contains optional WLAN technology that effectively turns it into a rolling Wi-Fi HotSpot. A SIM card can be placed into its WLAN router to receive Internet signals, which can be resent around the car as a wireless Internet signal. Up to three devices, such as laptops, mobile phones or tablets, can be connected simultaneously. The system supports HSDPA, UMTS, EDGE and GSM. The optional Bowers & Wilkins Premium Surround System is as good as it gets in production car hi-fi systems. The choice of components, the layout of the 15 speakers and the perfect configuration of HARMAN's QuantumLogic™ Surround Sound processing and system integration is the result of a long and very demanding process of experimentation and countless hours of listening by the best ears in the audio business. Bowers & Wilkins has close to 50 years' experience in the development of drive units and their materials. Materials like Kevlar - introduced in speaker cones by Bowers & Wilkins in the 1970s - are the result of decades of commitment to acoustic research and development. For the tweeter aluminium offers a combination of lightness and rigidity that's ideal, as the sound extends to the very limits of human hearing, unlike lesser fabric domes. For speed, stiffness and unshakable bass, Rohacell, which is normally used for aircrafts, rockets and performance cars' bodies, is the perfect cone material. The result is an audio system that perfectly reproduces every nuance of the recording; with crisp, pristine treble, amazing natural dynamics, and impressive bass. The system's natural, realistic performance delivers a completely new level of musical enjoyment on the road. Incorporating Keyless Go technology, the body of the new Quattroporte's key is made from polished aluminium and looks and feels heavy, elegant and technically advanced. When the car is locked, it is enough to keep the key in a pocket or a handbag and simply open the car by pulling on the door handle or luggage compartment button. This way, there is no need to always find the key to push a button to open the car. One objective was clear right from the start: to maximise the space available to the occupants. 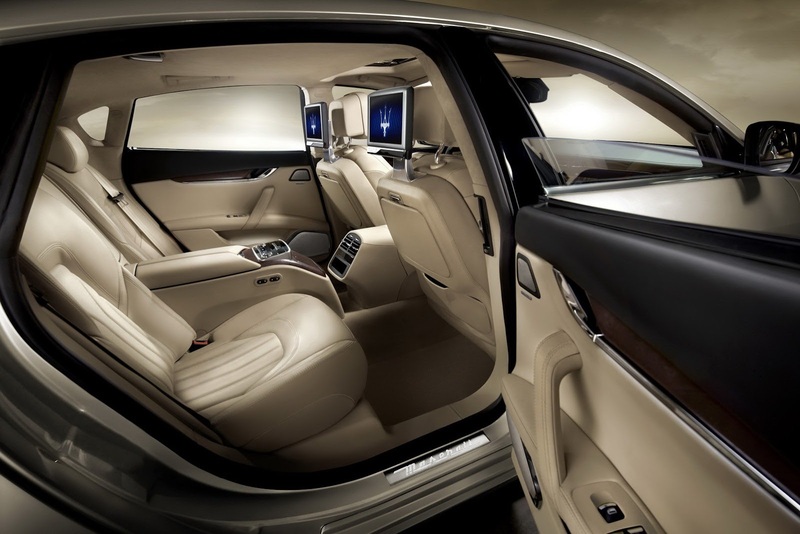 Special attention has been paid to the rear passengers, and the legroom available to them is the highest in the standard wheelbase class. 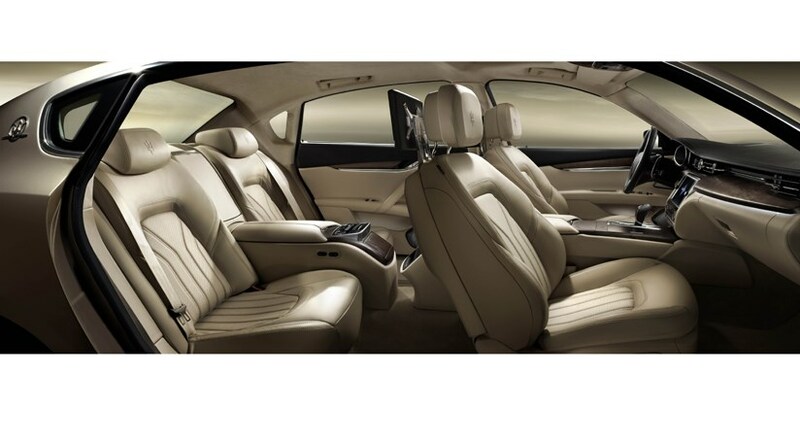 Two individual rear seats have also been developed as an option, to deliver outstanding comfort and prestige, and they offer unbeatable relaxation by featuring ventilation and electrical movement, in addition to standard heating. Furthermore, the interior features two front cupholders, four 12V power sockets, (one in the luggage compartment), a rear USB charging port and a number of large compartments: two at the bottom of the dashboard (a climate controlled, illuminated passenger glove compartment, and another for the driver), and a large front armrest. The rear seats are also modular in a 40/60 pattern: the smallest part can be folded down, thus allowing long objects to be stored in the back and inside the 530-litre luggage compartment. 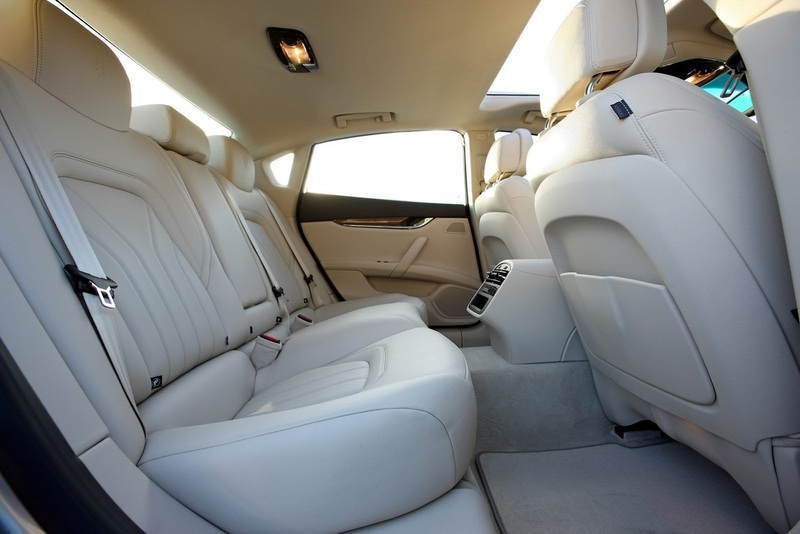 The luxurious leather seats offer the highest levels of comfort and support., The three-seats in the rear are designed to provide exceptional comfort along with abundant legroom. To highlight the attention paid to outstanding comfort and prestige, two individual seats have also been developed as an option, featuring ventilation and electrical movement, to offer unbeatable relaxation during long working trips. They can also be fitted with individual entertainment screens. The three rear seats are heated and the door panels feature electrical sun blinds, along with the rear window sun blind. The rear armrest has a USB socket for charging mobile devices and two foldaway cupholders. Finally, the seats are equipped with ISOFIX fittings, the universal child seat mounting system. 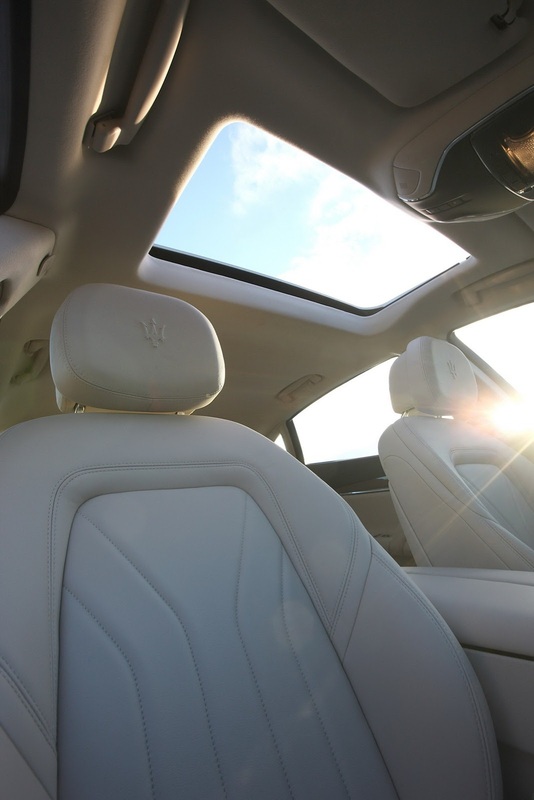 The interior of the new Maserati Quattroporte not only features unique styling and valuable materials, but also uses light to further enhance its lines and to improve the quality of the occupants' experience when driving in the dark. The system uses an optical fibre running along the dashboard and the doors, and even in the door handle cavities and door pockets, to give the interior a modern, sophisticated look. The front and rear ceiling lights mount a diffused lighting lamp and two separate reading lights; along with these, two LEDs concealed in the ceiling light give constant soft light for the area beneath them; even the foot area is illuminated. The brightness of the light can be adjusted with a dimmer. 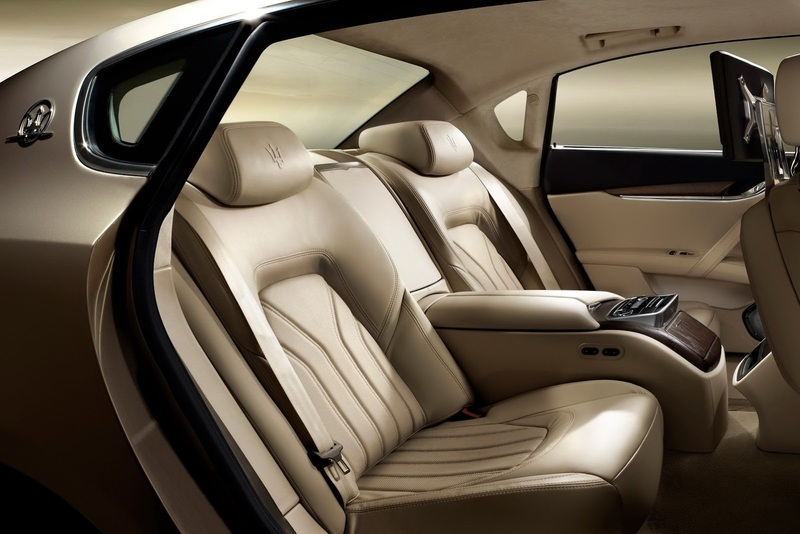 With the option of the rear-seat entertainment unit, the Quattroporte will feature two tilting 10.2" LCD displays. 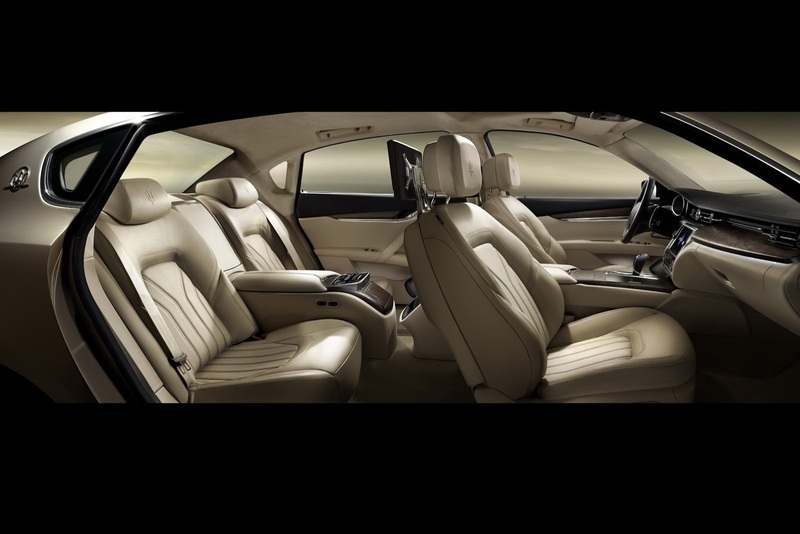 Rear-seat occupants can either view the same content simultaneously, individually or watch completely different content. The system allows users to reproduce audio, video or photographs from external sources and it can deliver them in formats ranging from MPEG, WMV, Xvid, MP3, MP4, WMA and AAC. It also has an A/V-IN connection for devices like video game consoles, cameras, video cameras and laptops. In addition, it can be equipped with a television tuner in Europe and China. Each monitor comes with an individual battery-powered remote and wireless headphones. 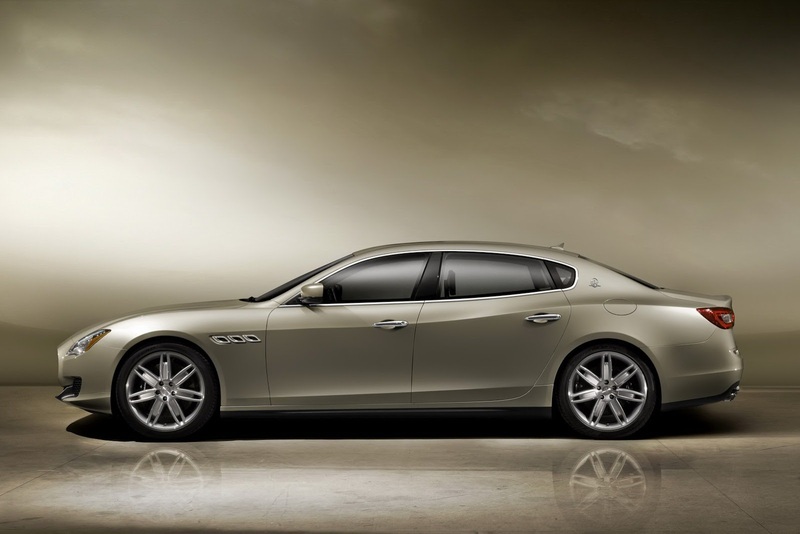 The new Maserati Quattroporte is intended not only to be safe and technically superb, but also comfortable. The windscreen and the rear window are both made from double laminated acoustic glass. As 51% of a car's external noise enters the cabin through the windscreen, the use of acoustic glass means Maserati could make the cabin more comfortable and focus on delivering just the type of noise Maserati owners prefer. The side windows employ similar technology with single-layer lamination and acoustic damping, thus reducing external noise and stabilising internal temperature, and at the same time, increasing the occupants' comfort and safety. In addition, all three rear windows can be fitted with darkened glass for greater privacy. The automatic climate control operates on a dual-zone system and delivers huge amounts of air through 13 ventilation ports: a demister on the windscreen, four outlets on the dashboard, two on the joint between the front pillars and upper door surround, two at the feet of the front occupants, two central ports on the rear unit and two more at the feet of the rear occupants. The four rear ventilation ports balance their output via a sunlight sensor. This provides outstanding levels of comfort and seamless maintenance of the chosen temperature. There are separate temperature adjustment functions for the driver and the passenger, which can be controlled through the MTC or via a physical control panel under the screen. Delivering 455 cubic metres of air an hour, the system performs much better than its predecessor, cooling or heating the air far faster than ever before. This power is driven by a variable-displacement compressor that is electronically controlled to ensure that its operation matches perfectly to the exact demands of the car's occupants. A wide array of sensors help the system maintain its internal environment, including a humidity sensor that governs the flow from the defrosting and demisting ports. Additionally, there is a sunlight sensor that regulates the temperature of the air from the ports to nullify the effects of the sunlight and outside temperature. A four-zone climate control system, which increases comfort for the rear passengers, is optional. It contains a dedicated nebuliser and two additional ports on the B-pillars to increase airflow to the rear of the car. It also delivers a separate temperature control unit for the rear passengers. Bellissimo il colore scelto per la presentazione, molto caldo e molto latino! il v8 ha 530 cv, confermate ? Interni belli, di lato bella, fari e fanalii non mi colpiscono per niente. Il faro anteriore è la cosa che più mi ha dato fastidio, d'accordo con Gimmo. Dovevano per forza farlo di quella forma? Per il resto niente male, Nei muletti sembrava un'Audi, adesso per fortuna non ha più tutta quella somiglianza!